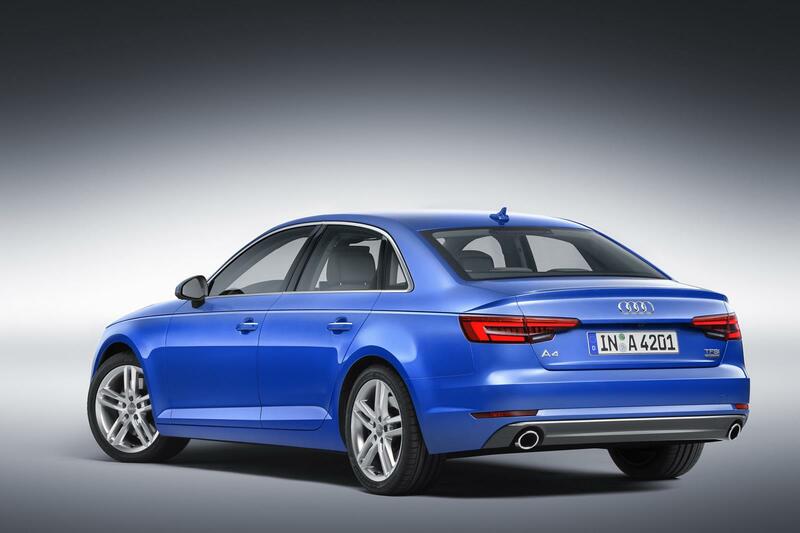 The current Audi A4 (B8) has been around since 2008, and of course it is now due for a complete renewal. 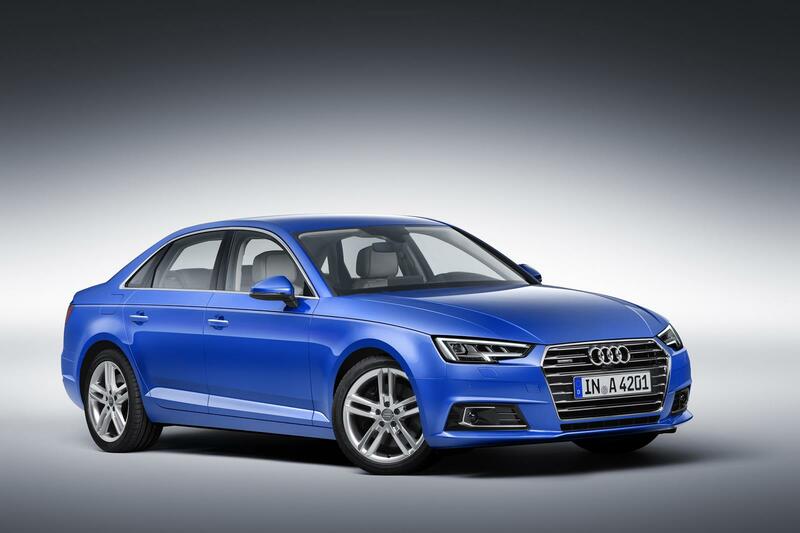 Today Audi announced the 5th-gen 2016 A4 (B9), based on MLB-Evo platform. Since the MLB-Evo is just an upgraded version of the current MLB architecture, you will not see dramatically revolutionary enhancements like full-aluminum or carbon fiber car body. On the 2016 A4, it uses a little bit more hot-stamped steel or aluminum parts in the car frame. 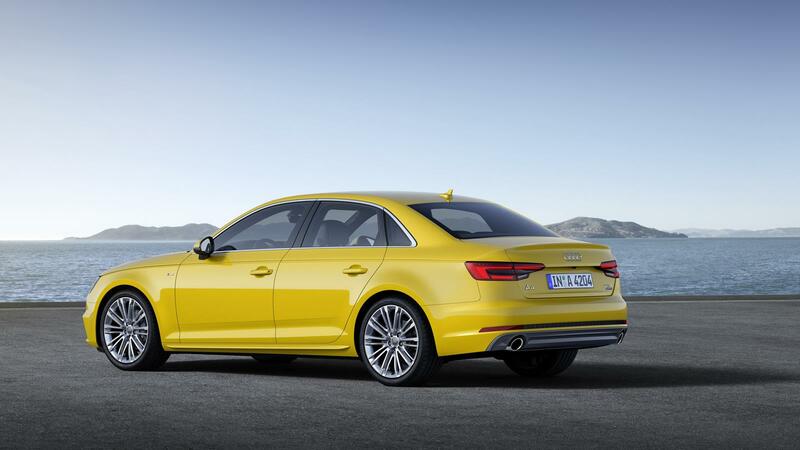 Due to this reason, regarding the body-in-white, the B9 A4 just slashed around 15kg from the current B8 A4. 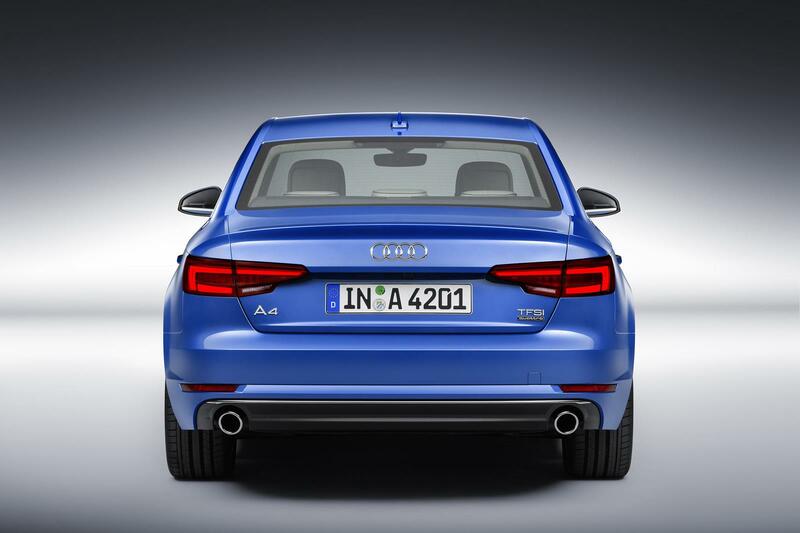 The new A4 has major change in the rear suspension design: it switches back to the 5-link type from the previous H-arm design. 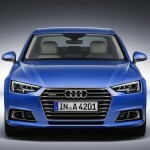 There is another major change for the B9 A4: it looks like Audi has given up its crown-gear center differential, therefore on the 2016 A4 with Quattro AWD system, it is using the Torsen C differential (please note: Audi has a long tradition of using the Torsen differentials in its vehicles previously; the crown-gear type is the firm’s attempt to design/build a different central differential than buying it from JTEKT Torsen, a company now owned by Toyota) . The 2.0L TFSI is the 4th-gen EA888 engine, added the Miller cycle and increased the compression ratio to 11.7:1 and fuel injector pressure to 250 bar; the intercooler is also changed to the air-to-liquid type. Its intake and exhaust manifolds are all integrated into the cylinder head, making it one of the most compact 2.0L 4-cylinder turbo engine in the market. Althogh its cylinder block is still made with forged steel, not aluminum, the service weight of the 4th-gen EA888 is quite light (only 140kg) – it is even lighter than some of the aluminum-block turbo 4-cylinder engines such as the Mercedes-AMG M133. 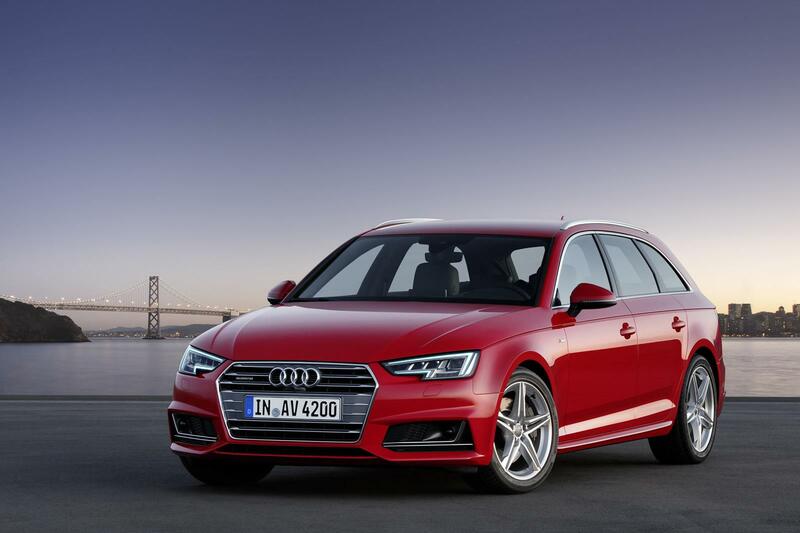 Generally speaking, compared to the current B8-gen A4, the 2016 A4 can be seen as an mid-scale evolution, not a revolution. Please see more details in the following press release, and watch the extensive gallery after that. When it comes to aerodynamics, the two new models dramatically outpace the competition. 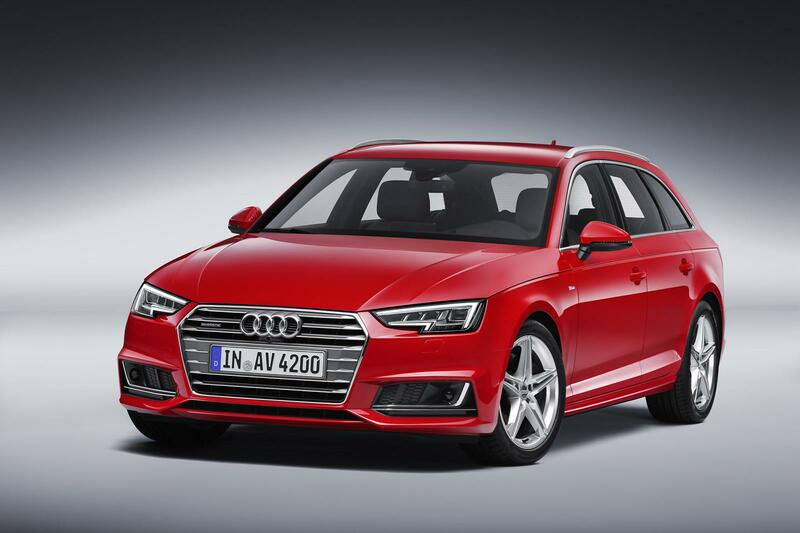 The A4 Sedan has a drag coefficient value of 0.23, and the Avant has cd 0.26. These extremely low figures are the result of complex fine-tuning and new solutions. The outer lines of the air inlets integrate additional openings – they guide some of the air stream over the wheel well, where it flows past wheels which have also been aerodynamically optimized. Details such as the exterior mirrors positioned on the door sills with their small integrated narrow stripes help enhance the aeroacoustics. In every new car, the rear design plays a key part in automotive aerodynamics. On the new Audi A4 Sedan, the lines of the luggage compartment door make sure that the air flow is smooth. On the Avant, a roof edge spoiler with a strong downward slant performs this function. Narrow trim on both sides of the back window are the finishing touch on the aerodynamic concept. 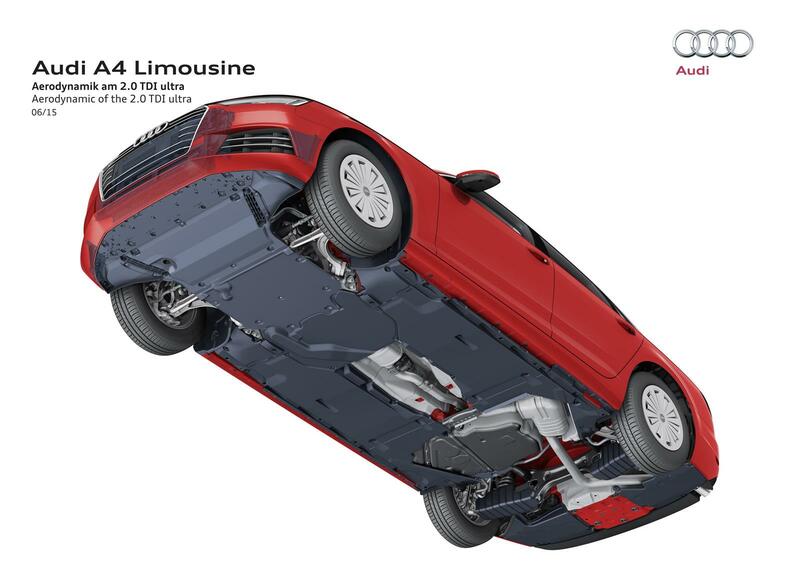 The underbody of the new mid-sized models also contributes to their aerodynamic lines. 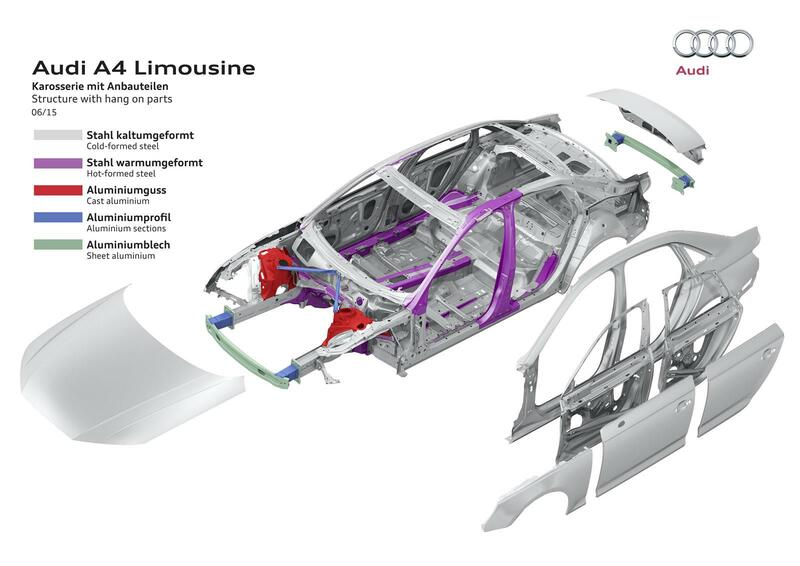 The underside of the engine compartment is sealed off from the road, and broad trim under the passenger cell and the luggage compartments protects the metal. The wishbones on the rear axle are specially enclosed, and small spoilers guide the air flow at multiple sites, including under the wheels and at the tank. In conjunction with the design of the tailgate, the aerodynamically optimized underbody keeps the lift of the rear axle low. 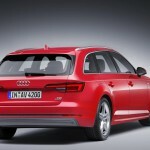 The A4 TDI ultra models work with another kind of new aerodynamic technology: controllable cool-air inlet. This is a frame installed behind the radiator grille which houses two blinds that can be activated independently. They are closed as the car starts so that air resistance stays as low as possible, and when air is needed to cool the engine, first the lower and then the upper blind opens. 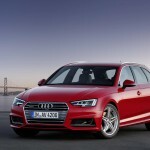 With their wide range of driver assistance systems, the new Audi A4 and A4 Avant are setting benchmarks for the class. Nearly all of the equipment has been completely redesigned or greatly enhanced in comparison to previous models. Some of the systems are standard features, whereas the optional solutions can be chosen individually or are available in the packages Parking, City and Tour. The optional Audi pre sense basic works with information from a variety of different vehicle systems. Once it detects unstable driving conditions, it initiates preventive measures to protect the occupants. The front seat belts are electrically tightened, and the windows and sunroof are closed. The hazard lights are also activated. If a collision cannot be prevented and an accident is inevitable, the multicollision brake assist system supports the driver with controlled application of the brakes. This can help to prevent the car from skidding, which prevents further collisions. Another standard system in the new Audi A4 and A4 Avant is attention assist, a component of the driver information system. It analyses driver behavior and issues a warning when it detects that the driver is becoming inattentive. The adjustable speed limiter, a standard feature, can be set to a particular speed ranging from 30 to 250 km/h (18.6 to 155.3 mph) – a very helpful tool for maintaining speed within city limits, in construction areas, and so on. Amongst the optional systems, the key feature is the adaptive cruise control (ACC) Stop&Go including traffic-jam assist. 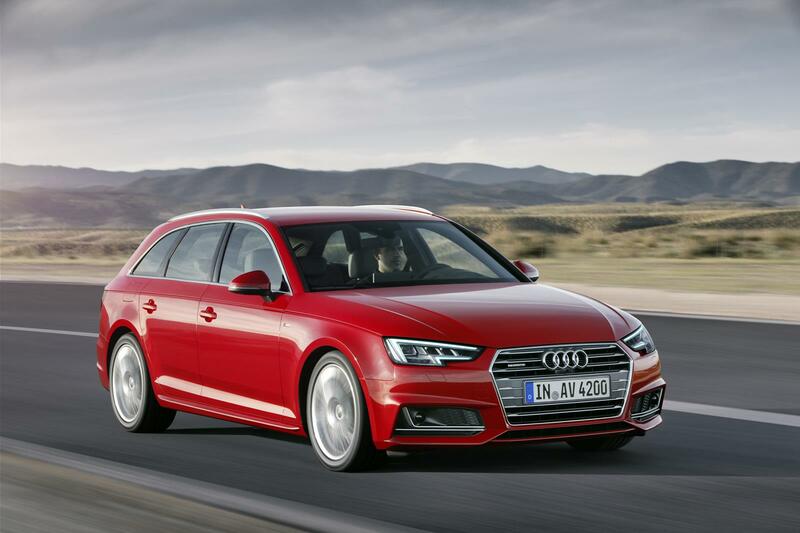 It maintains a specified distance between the new Audi A4 and A4 Avant and the car ahead; the driver can choose one of five distances and use Audi drive select to adjust the rate of acceleration and control dynamics. The system, which relies on the signals from the two front radar sensors and the camera, interacts with the S tronic and the tiptronic to cover the full range of speeds from 0 to 250 km/h (155.3 mph); in manual transmissions, it starts at 30 km/h (18.6 mph). The ACC’s Stop&Go function (only available with automatic transmissions) can brake the new Audi A4 to a full stop, and at the driver’s wish it can automatically resume driving again. When the system is deactivated, the distance display shows how far the car ahead is, and it warns drivers when they are tailgating. Its operating range is at speeds of 60 km/h (37.3 mph) and above. When the traffic-jam assist reaches its system limits – for example, when the traffic thins out or there is a sharp curve ahead – the driver has to take over again completely. The system provides warnings at different levels. 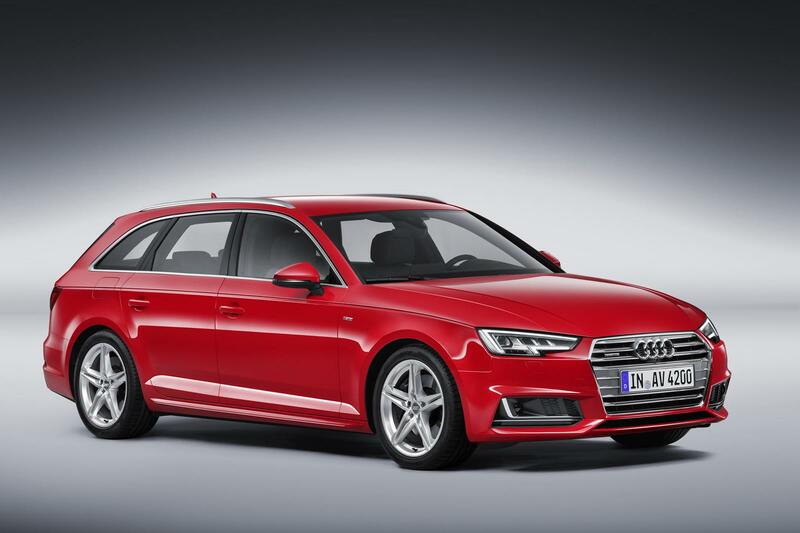 As a final measure, it safely brings the A4 and A4 Avant to a full stop. Thanks to the ACC, the Audi pre sense front safety system on board can prevent rear collisions or help minimize impact. In dangerous situations, the system gives the driver a variety of warnings to brake: visual and acoustic signals as well as a tap on the brakes. If the driver does not respond, the car first starts to brake, and simultaneously it closes the windows and the sunroof. 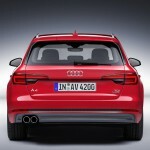 As the only model of its class, the A4 then decelerates as much as possible if the car in front of it is still moving. The system automatically tightens the seat belts. Audi pre sense front also works when the ACC is not running. Even when the navigation function is not on, the predictive efficiency assistant uses the data from the route to keep the driver informed about situations which call for lower speed. The system recognizes curves, roundabouts, road junctions, gradients, city limits and speed limit signs – in many cases long before the driver sees them. A corresponding warning appears in the combination instrument and/or the Audi virtual cockpit and head-up display. If the assistant screen is active, detailed graphics can be seen. If the driver wishes, the system can take over the freewheeling of the automatic transmission itself under certain conditions. This form of “coasting” is only activated if it can last for at least five seconds. When it ends, the car automatically accelerates to the speed the driver has selected if the ACC is activated. The predictive efficiency assistant can reduce fuel consumption on country roads by up to 10 percent. The Audi active lane assist is available separately or as part of the Tour assistance system. At speeds of 65 km/h (40.4 mph) and above, it helps drivers stay in their lanes. It receives its signals primarily from the front camera, which detects lane markings. 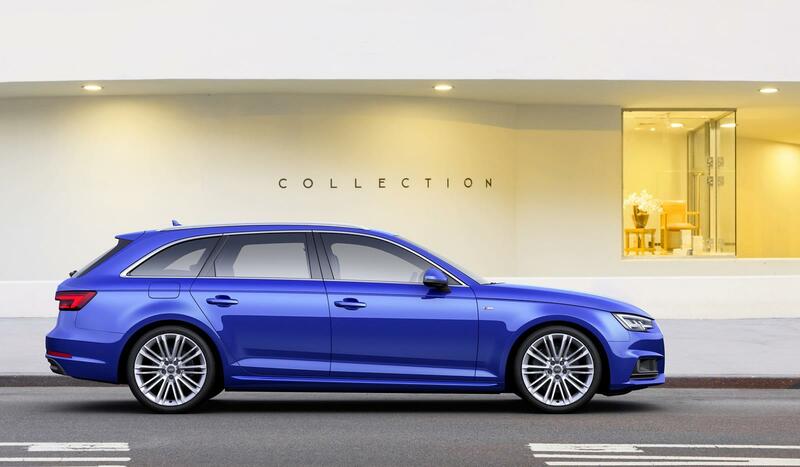 If the new Audi A4 and A4 Avant approach a marking when the driver has not switched on a turn signal, the system makes a gentle adjustment to the electromechanical power steering to bring the car back into its lane. Using the MMI system, drivers can decide whether this support should be activated at all times or only take place before the lane marking is crossed. If they choose the early-correction mode, the system will guide the car back into the middle of the lane. There is also the optional setting of making the steering wheel vibrate as a signal. The avoidance assist is yet another high-end feature in the Tour assistance system. 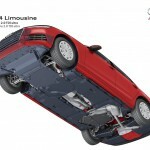 It activates when the new Audi mid-sized models have to avoid an obstacle so as to prevent an accident. Within fractions of a second, it uses data transferred from the front camera, the ACC and radar sensors to calculate the distance of the car ahead as well as its width and degree of offset. Its first warning is a tap on the brakes to alert drivers to the potential danger. As soon as the driver starts steering, the system offers support with the necessary lane changes with controlled interventions to the power steering. The camera-based traffic-sign recognition assist (also available separately) rounds out the Tour assistance system. It identifies many traffic signs, including digital displays, and shows them to the driver as graphics in the head-up display and instrument cluster. The driver can also opt for visual warnings when he or she exceeds the speed limit indicated on traffic signs. If another vehicle approaches quickly or is in the blind spot, a warning LED in the housing of the appropriate side mirror lights up. If the driver turns on the turn signal anyway, the LED blinks brightly many times in succession. 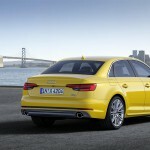 Upon request, the Audi side assist can be complemented by integrating the Audi pre sense rear system. 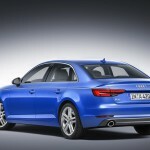 It warns about potential collisions from behind and takes preventive measures such as activating Audi pre sense basic. Furthermore, it makes the hazard lights blink rapidly as a way of warning traffic behind the car. It remains active in the background at every speed even if the Audi side assist is turned off (unless a trailer is in use). Other systems complete the City assistance package: the acoustic and visual park system plus, which automatically activates when it detects an obstacle, and the reversing camera. Both systems are also available separately. The 360-degree cameras are the second component of the package. The MMI monitor displays different perspectives from the car’s immediate surroundings, including a virtual view and 180 degree images from the front and rear. Guidelines make it easier to maneuver in reverse gear. The 360-degree cameras are especially helpful in dealing with parking spaces or driveways where visibility is poor, and the cameras are also useful together with the rear cross-traffic assist in the rear. A fully equipped new Audi A4 or A4 Avant has some 90 control units on board, many of which exchange data with each other. This kind of tight-knit interaction, especially among the driver assistance systems, would not be possible without a brand new approach to the car’s electronic architecture. The new FlexRay bus system connects several control units with each other and guarantees extremely rapid and secure data transfer. The most important components are the engine, the automatic transmission, the central chassis control unit, electronic stabilization control (ESC), the power steering control unit, the adaptive cruise control Stop&Go including traffic-jam assist, the video camera and the safety computer which steers the safety systems. There are other data networks in addition to the FlexRay bus. CAN (controller area network) buses connect some of the assistance systems such as the Audi side assist, 360 degree cameras and the air-conditioning system. Furthermore, they are part of the communication between the convenience functions, the infotainment components and the central display and control components, such as the MMI and Audi virtual cockpit. LIN (local interconnect network) buses complement the CAN buses by operating less complex integrated systems such as interior lighting. The Bang & Olufsen sound system with 3D acoustics uses a MOST (media oriented systems transport) bus. 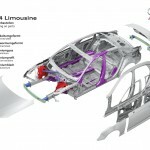 In these new Audi mid-sized models, the electric systems also contribute to the light vehicle weight: enhanced topology, new aluminum cables and an AGM battery lower the weight by six kilograms (13.2 lb) in comparison with the earlier model. 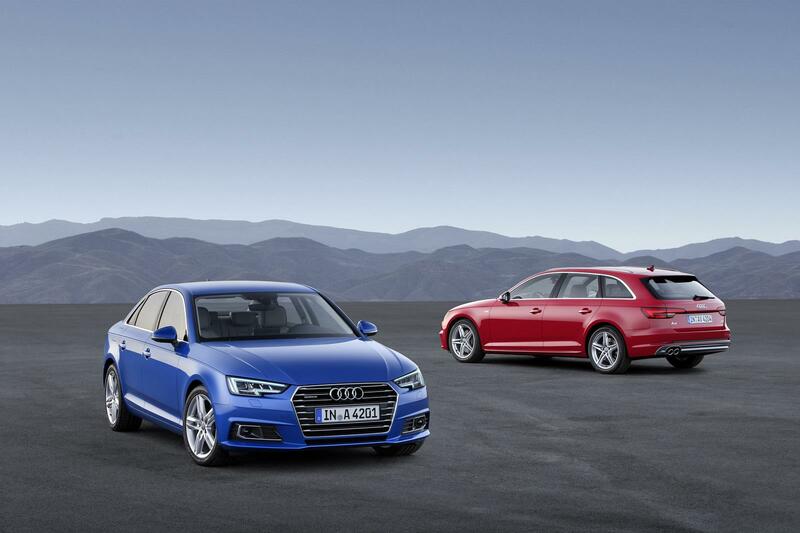 Premium, light, spacious – the new Audi A4 and A4 Avant surpass their predecessors in almost all interior dimensions. Shoulder width and head clearance for driver and front-seat passenger have increased by 11 and 24 millimeters (0.4 and 0.9 in). Interior length has grown by 17 millimeters (0.7 in) and rear legroom is actually 23 millimeters (0.9 in) larger. 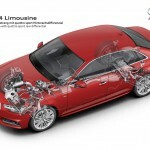 The new Audi models set the benchmark in their class in these important criteria. All four seats therefore offer a feeling of genuine spaciousness. The interior design underscores this impression, as its clear architecture is strictly focused on horizontal lines. This principle is most apparent with the low dashboard – it seems to float in space, supplemented by the cover over the combination instrument and the Audi virtual cockpit. A band of air outlets is arranged over the gently sloping, curved front of the dashboard, punctuated only by the instruments – it combines elegant design and novel functions. The upper edges of the dashboard and the door trim border the interior in a wrap-around style, without constricting the driver and passengers. The wide, asymmetrically split central console houses the MMI control element. Its design and position vary according to the car’s transmission. If the car is fitted with S tronic or tiptronic, the terminal is placed close to the dashboard; the low automatic selector lever offers the wrist a comfortable resting place. With manual transmission, the selector lever is in front of the MMI terminal. In both cases, the volume control and a storage tray are located on the right of the MMI control terminal. This arrangement makes the philosophy of the new A4 family clear. For example, although the interior is focused on the driver, the MMI monitor can be used equally well by the front-seat passenger. The monitor is an element in which Audi’s entire design expertise is reflected – with its black display glass with rounded corners, it looks like an exclusive tablet computer. It is just 13 millimeters thick (0.5 in), and has a discreet silver-colored magnesium frame in the top version with MMI Navigation plus. Operation of the automatic air conditioning is another highlight – especially with the deluxe automatic air conditioning, which has temperature displays integrated into the control dials. Just a few buttons and dials are sufficient for convenient control. When one of the capacitive rocker switches is approached by a finger, its function is shown enlarged on the dark LCD display and selected. Both the standard single-zone system and the triple-zone deluxe automatic air-conditioning have been completely redesigned. Both systems consume little energy thanks to efficient solutions for the fan motor and fresh-air supply, an efficient cooling circuit and highly flexible controls. However, they provide an extremely high air quality: In both fresh-air and recirculating operation, an active-carbon combination filter removes the smallest particulate matter. The comfort of the experience is rounded out by low noise levels. With the deluxe automatic air-conditioning, the broad band of air vents allows indirect ventilation while increasing the volume of air circulated. The interior can be air-conditioned in three separate zones; the rear passengers have their own control unit with a digital display. 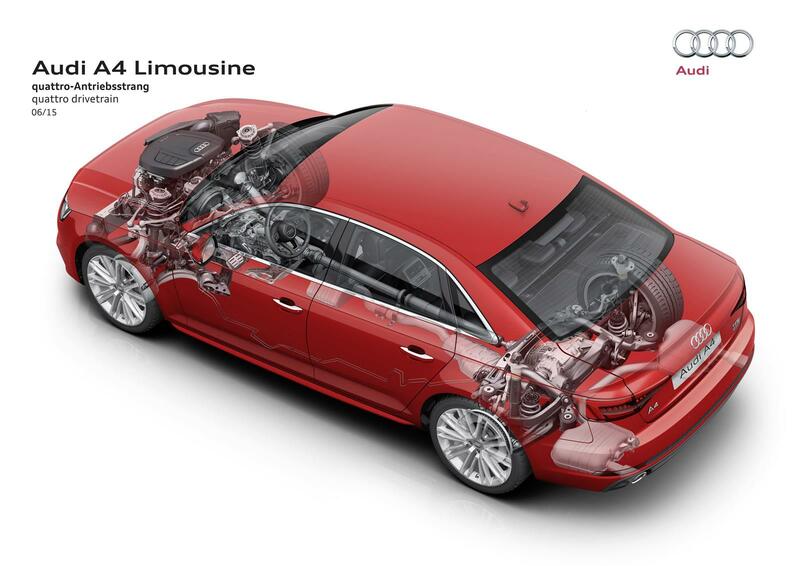 Audi also offers the option of an auxiliary heating system, which quickly warms the interior. In connection with the optional Audi connect operating system, the auxiliary heating can be conveniently programmed with a smartphone app. 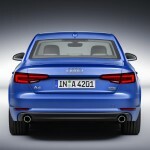 The seats of the new Audi A4 and A4 Avant have also been completely redesigned. With the anatomically shaped front seats, the head restraints can be adjusted not only for height, but also for distance from the head. Many of the model versions have seat heating. Alternatively, the seats can be ordered with partial or full electric adjustment and with electric lumbar support, as well as with heating and ventilation for the sports seats. 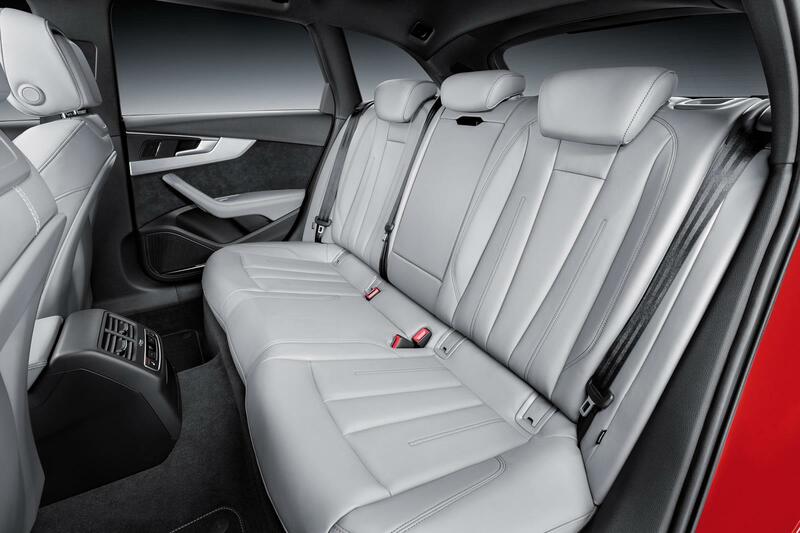 A central armrest in the front – adjustable if desired and with a large storage space – large door pockets and two cup holders are standard equipment with the new Audi A4 and A4 Avant series. The optional storage and luggage-compartment package includes a rear armrest with two cup holders, nets on the rear of the front seats and other practical storage spaces adjacent to the driver and in the luggage compartment. The steering wheels are all new; the driver’s airbag is a compact micro-module and allows a better view of the combination instrument. There is a wide range of steering wheels available. The base version is a three-spoke multifunction steering wheel with a boss in the form of the Singleframe grille. Depending on the model line and the customer’s wishes, there is also a round boss, a heatable leather-covered steering wheel, a steering wheel with a flatter lower segment, chrome trim in the lower spoke and the plus option for the multifunction feature. The frame of the steering wheel is made of magnesium – the entire interior was designed strictly along the lines of lightweight construction. Components made of magnesium and a light wire frame are also used in the in rear seats; the substructure of the front seats is made of high-strength steel. Compared with the previous model, the weight of the seats has been reduced by up to nine kilograms. A new carpet, an aluminum brake pedal and foamed defrost ducts in the air-conditioning system shave another four kilograms (8.8 lb) off the weight. As always at Audi, all materials in the interior of the new A4 and A4 Avant have been selected and processed with the utmost care. Precisely fitted chrome strips border the upper edge of the air vents, the controls of the automatic air-conditioning and the automatic selector lever on the central tunnel console. The door-handle recesses are directly inset into the door trim – a novel and highly attractive detail. All seams are extremely narrow and parallel. The lighting package has white LEDs in the standard version. The driver can operate the reading lights via sensors. At night, the optional interior lighting package or the optional ambient lighting provide small highlights in the interior. With the top version, the color of the illumination can be controlled via the MMI, in several profiles and in separate zones, including the cup holder. The colors change depending on the mode chosen in Audi drive select. In the door trim, narrow, LED light strips generate effective contour illumination. The colors and materials also underscore the generous dimensions and elegance of the interior; the palette offers numerous new shades and combinations. With the design and design selection equipment lines, the dashboard can be divided into two color zones. There is a choice of black or granite gray for the dark upper area, and of atlas beige, rock gray or black for the lower zone. The same colors are also available for the seat upholstery, as well as nougat brown. With the upholstery materials, the first stage of options after the standard materials consists of two exclusive materials for the design and sport equipment lines. Alternatively, a robust combination of genuine leather and synthetic leather can be selected. The central panels of the front seats and of the two outer rear seats as well as the side bolsters of the driver’s seats in the entry area are upholstered with leather. Milano leather, the alcantara/leather combination (only for the sport seats) and the top-quality fine nappa leather with contrasting stitching and cording are the finest upholstery available. The supplementary leather package includes the armrests and knee pads. The large inlays are a significant feature of the interior’s appearance. Audi supplies them in diamond silver gray gloss as standard equipment. Alternatives are printed aluminum ellipse and dark walnut root wood. With the S line sport package, the interior is either black of rotor gray. The sport seats are upholstered with a combination of pearl nappa leather and sequence cloth; alternatives are pearl nappa leather with embossed frequency Alcantara or fine nappa leather. The backrests of the front seats always feature S logos in connection with the S line sport package. The inlays consist of brushed aluminum or piano black lacquer. The sport steering wheel, the illuminated door-sill trims and the fender feature S emblems. The sporty appearance is completed with stainless-steel pedals and footrests as well as floor mats with contrasting stitching. 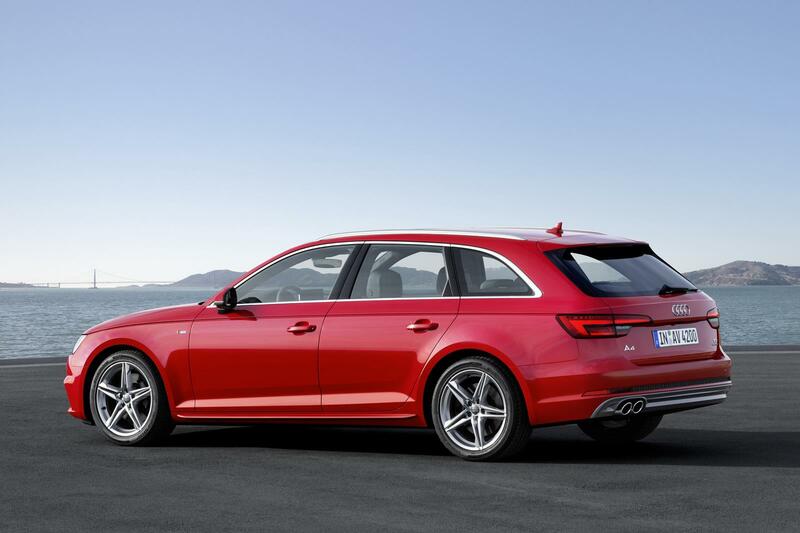 A second highlight for the new Audi A4 and A4 Avant is design selection. In this case, the dashboard is either black or in combinations of the colors granite gray or wapiti brown with rock gray or atlas beige; the same colors are used for the seat upholstery. The materials are the same as those of the S line sport package. The steering wheel is also available in color-matching black, granite gray or wapiti brown. For the decorative strips, the customer can choose between aluminum trimaran and gray natural oak wood. The design selection is supplemented with ambient lighting in varying colors. Both packages have illuminated door-sill trims. 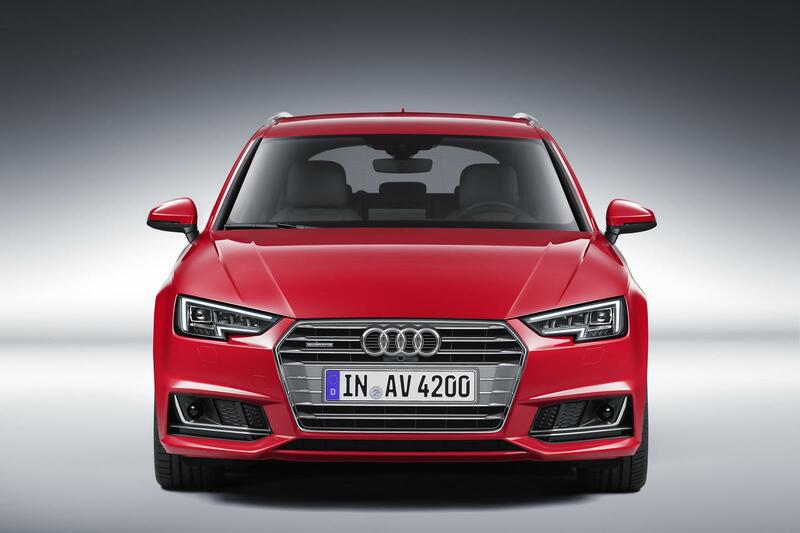 With its innovative display and control concept, the new A4 model family is at the peak of its segment. Using the central components – the Audi virtual cockpit and MMI touch, both optional extras – the driver can use a multitude of functions in a way that is not only easily comprehensible, but fun as well. As standard equipment, the new Audi A4 and A4 Avant are fitted with a large, easily readable, analog tachometer and speedometer. The display of the driver information system is located between those two instruments. In the basic version, the driver information system has a 5-inch display. If MMI Navigation plus is selected, Audi supplies a 7-inch monitor. It presents data such as radio station, music lists or navigation information. The Audi virtual cockpit is available as a high-end option, provided that MMI Navigation plus with MMI touch is on board. Its 12.3-inch LCD monitor with a resolution of 1,440 x 540 pixels ensures highly detailed graphics. For example, engine speed calculated 60 times a second so that the virtual needle is extremely precise and moves smoothly. Scroll-down lists follow a physical model so that factors such as inertia, elasticity and damping are considered. With the “View” button on the multifunction steering wheel plus, the driver can switch between two different user interfaces. The infotainment mode is dominated by a central window – it offers items such as the navigation map or lists from the areas of telephone, radio and audio. The tachometer and speedometer are presented here as round instruments. In the classical view, the instruments are shown in about the same size as analog dials and the central window is correspondingly smaller. The Audi virtual cockpit presents information comprehensively and in various ways – from the navigation arrows to dynamic animations and the infotainment features (including connect services) as well as the graphics of some assistance systems. The display changes its color design depending on the basic menu: orange in the media menu and green in the telephone menu for example. At the lower edge, there are permanent displays of exterior temperature, time of day and mileage, as well as warning symbols and other information. As with the display of the driver information system in the analog instrument, the driver operates the Audi virtual cockpit with the optional multifunction steering wheel plus. The switches on the left spoke are used to move through the menus of the audio system, onboard computer and – if fitted – navigation system and telephone; the user interface can be changed with the “View” button. The volume control, voice-control system, telephone express control and the skip function for rapidly changing radio stations or music tracks are located on the right spoke of the steering wheel. Another technical innovation in the Audi A4 and A4 Avant is the MMI-System, especially in the full version as MMI Navigation plus with MMI touch. Its menu structure has been completely redesigned; its operation with flat hierarchies is oriented towards modern smartphones. An intelligent logic that is simpler and quick to use replaces static menu trees; frequently used functions can be reached with just a few clicks. The terminal’s central element is the rotary controller, whose ring is illuminated in white with the optional MMI touch. Its upper surface features a touchpad, which is used to input characters and multi-finger gestures – zooming into the navigation map for example. The terminal also has buttons for the most important basic menus, the general menu button, the “Back” button and eight freely programmable favorite buttons. Two more buttons on the left and right of the rotary controller allow access to the function and option menus, which supplement many operating areas. For example, the driver can select the waveband in the radio menu or access traffic information in the map menu. With the functions and options, the driver can be navigated to a programmed destination and display parking spaces in the vicinity, or can store the destination in the favorites list. A particular highlight of the new system is the MMI search, which is available for all basic menus and which accepts free text input like an Internet search engine does. It generally reacts after the input of just a few letters and takes the car’s position into consideration. When looking for a restaurant for example, it is sufficient to input its name and the first letter of the city – a list of results then appears, Europe-wide and including full addresses. Searching for song titles, albums and radio stations works in the same way. The voice control system has also been intensively further developed and now understands many phrases from everyday speech. In order to make a phone call, it is sufficient to say “I want to call Peter Miller.” The navigation system also reacts to natural speech (“Where can I fill up?” or “Where is the nearest Italian restaurant?” for example). The new voice control system, which also allows the dictation of text messages, is also available in the radio and media menus. MMI Navigation plus with MMI touch makes use of the concentrated power of Audi’s new modular infotainment platform. Its main processor combines two main levels – the radio car control unit and the MMX board (MMX= Multi-Media eXtension). The board is designed as a plug-in module, so in the development process, Audi can always keep it up to date and bring innovations from the field of consumer electronics into the car without delay. The second-generation modular infotainment platform, which is used by the new Audi A4 and A4 Avant, includes a Tegra 30 processor from cooperation partner Nvidia in the MMX board. The quad-core chip from the Tegra 3 series, which operates in conjunction with special 3D graphics software, processes all of the online, media, voice-control, navigation and telephone functions. With a clock rate of more than one gigahertz and a powerful graphics card, it can carry out eight billion calculations per second. 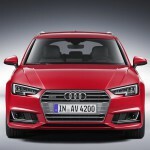 As an option, Audi offers a head-up display in the new A4 and A4 Avant. The system projects relevant information onto the windscreen in the form of easily comprehensible symbols and characters. A TFT monitor with white LED backlighting generates the color image. Two aspherical mirrors enlarge and reflect it, as well as compensating for distortion caused by the geometry of the windscreen. The information appears in a window 200 by 80 millimeters in size (7.9 by 3.1 in) and appears to hover about two meters (6.6 ft) in front of the driver. The eyes register it extremely fast as they do not have to adjust to a closer field of vision. Using the MMI, the driver can determine which information the display should show, and can also adjust the height and brightness of the display. The standard MMI radio plus with eight loudspeakers includes an SDXC card reader, an auxiliary input, a USB connection, Bluetooth and voice control for telephone and radio. The MMI monitor has a 7-inch diagonal and a resolution of 800 x 480 pixels. The rotary controller is the central feature of the MMI control concept. MMI Navigation, the next step, additionally offers two card readers, the voice-control system and a navigation function by which the data is stored on a memory card. With MMI Navigation, the rotary controller includes a joystick function for switching between the individual menus. The system also allows access to the voice control of the customer’s smartphone, displays e-mails and reads them out loud. Audi’s high-end version is MMI Navigation plus with MMI touch. In addition to the MMI Navigation features, it includes 10 gigabytes of flash storage, a DVD drive, Audi connect services for three years, up to five free navigation updates (available at six-month intervals), a further improved voice-control system and an 8.3-inch monitor with a resolution of 1,024 x 480 pixels. MMI Navigation plus operates in close cooperation with many of the assistance and safety systems. The hardware module Audi connect is the ideal supplement to MMI Navigation plus with MMI touch. An LTE/UMTS module provides today’s fastest Internet connection with download speeds of up to 100 megabits per second; the integrated Wi-Fi hotspot allows the car’s passengers free surfing, streaming and mailing with up to eight mobile devices. For the driver, it includes the tailored online services of Audi connect. 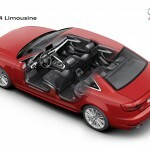 Audi connect offers a broad spectrum of features ranging from navigation with Google Earth and Google Street View to online traffic information and parking space searches and to the Twitter social network. All of these processes were especially designed for use in the car. 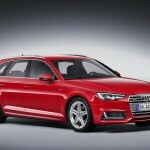 The new Audi A4 and A4 Avant make use of further services via the smartphone app MMI connect. Online media streaming with access to the music offered by Napster and Aupeo! as well as other online radio stations ensure great entertainment. Music data is transferred by Wi-Fi to MMI Navigation plus and from there to the sound system. Destinations from Google Maps, points of interest and dates from the City Events service can be transferred from a smartphone to the car using this app. Services under the heading “Audi connect myService” are new in the A4. They include functions such as emergency call, online breakdown call, remote control and Audi Service Appointment online. With the latter, if the customer so wishes, the car sends service-relevant data via an Audi server to the customer’s preferred workshop. These services can be used free of charge for ten years. The functions of Audi connect vehicle control (free of charge for three years) are convenient and informative. They include vehicle status reports, remote control for locking and unlocking, information on the car’s parking position and remote control for the optional auxiliary heating. The functions are operated via the MMI connect app. As a supplement to the infotainment program, Audi offers additional components including a digital tuner with DAB+ for radio and TV. The Audi phone box in the central armrest wirelessly connects the mobile telephone via near-field communication with the car’s antenna and allows inductive charging according to the Qi standard, provided that the device is compatible. The current flows from a coil in the base of the box to a receiver coil in the smartphone. The new Audi A4 and A4 Avant also set entirely new standards for high fidelity audio in the mid-size range. The optional Bang & Olufsen 3D Advanced Sound System offers a fascinating innovation – a sound that includes the spatial dimension of height. It utilizes four additional loudspeakers, two each in the dashboard and the A-pillars. The 3D sound allows an audio experience that is completely new in a car: The music conveys a genuine concert-hall feeling. The new technology is based on an algorithm that Audi developed itself together with the Fraunhofer Institute for Integrated Circuits in Erlangen. The program the uses the information from stereo or 5.1 recordings to calculate the third dimension and processes it for the additional loudspeakers. The heart of the Bang & Olufsen Sound System with 3D sound is a 755-watt 16‑channel amplifier that feeds 19 loudspeakers. The speaker covers feature a new design with long aluminum strips harmonizing with the lines of the A4 interior. White fiber optics illuminate the base drivers in the front doors. The new Audi A4 and A4 Avant will frequently be used as family cars, which means that soon after market launch, another innovation will be available as rear seat entertainment and as an in-car entertainment system: the Audi tablet. The device has a high-resolution 10.1-inch display (1,920 x 1,200 pixels) and connects with MMI Navigation plus via Wi-Fi, allowing access to the menus of the radio, media, navigation and car functions. For example, the rear-seat passengers can send a planned route to the driver, or the driver can start a radio or media program for them. Sound output is through the car’s sound system or through headphones. The Audi tablet uses the Android operating system and supports NFC technology (near-field communication) for easy connection with NFC-compatible Bluetooth headphones. The technical heart of the tablet is the extremely powerful Tegra 40 processor from NVIDIA. The 32-gigabyte internal memory can be extended with micro-SD cards. A click on the “Apps” button in the start menu opens the Android environment – with access to a multitude of apps and games, films and music, e-books and office applications. The integrated full-HD camera can be used for video calls. At the end of a journey, the occupants can take the Audi tablet out of the car with them and can use it offline or in a Wi-Fi network. The Audi tablet and its battery are designed for use in the car. They cope easily with high or very low temperatures, and the swiveling holder on the back of the front seat fulfils the requirements of crash safety. The frame is machined from solid aluminum – it epitomizes the premium character of the Audi tablet, which is available as a single unit or in a set of two. Another function is the Audi smartphone interface – it brings Apple Car Play and Android Auto on board. When the customer plugs an iOS or Android smartphone into the USB port (iOS 7.1 and up, Android 5.0 Lollipop and up), smartphone contents such as navigation, telephone, music and selected third-party apps can be accessed in a separate MMI menu. The contents can be easily used via MMI or voice control. Both applications are specially designed for use in the car. The core of the offering is online music with access to the enormous range of Google Play Music and iTunes. In addition, there are navigation functions, news and appointment reminders. Apple Car Play and Android Auto can be operated via the multifunction steering wheel, voice control or the rotary controller. The offering can be expanded even more further through third party apps such as Pandora, Spotify and WhatsApp. 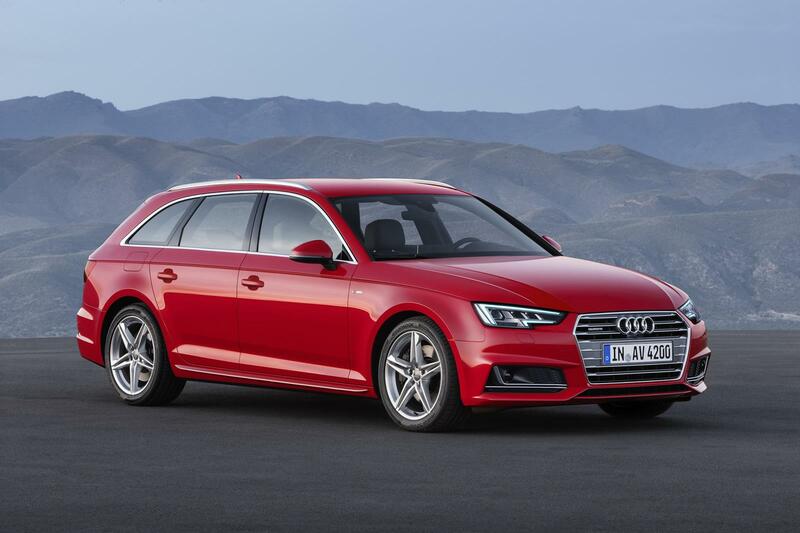 At market launch in Europe, the new Audi A4 and A4 Avant will be available with a choice of three TFSI and four TDI engines delivering maximum power of between 110 kW (150 hp) and 200 kW (272 hp). Compared with the previous model, their fuel consumption has been reduced by up to 21 percent, while their power output has increased by up to 25 percent. All engines comply with the Euro 6 emission limits, so that the TDI has been labeled a clean diesel. There is a standard 12-liter tank or an optional 24-liter tank for the required AdBlue additive. The standard, start-stop system has also been further improved and comes with new features to reduce fuel consumption further: When the driver stops at a red light, the engine can already be deactivated below 7 kilometers an hour (4 mph); 3 km/h for the A4 3.0 TDI with tiptronic (1.9 mph). The entry-level gasoline engine is the 1.4 TFSI. The compact four-cylinder with displacement of 1,395 cc, has a maximum output of 110 kW (150 hp) and torque of 250 Nm (184.4 lb-ft) between 1,500 and 3,500 rpm. In combination with the seven-speed S tronic transmission, it accelerates the A4 Sedan from 0 to 100 km/h (62.1 mph) in just 8.9 seconds and on to a top speed of 210 km/h (130.5 mph). The corresponding figures for the Avant are 8.9 seconds and 210 km/h (130.5 mph). 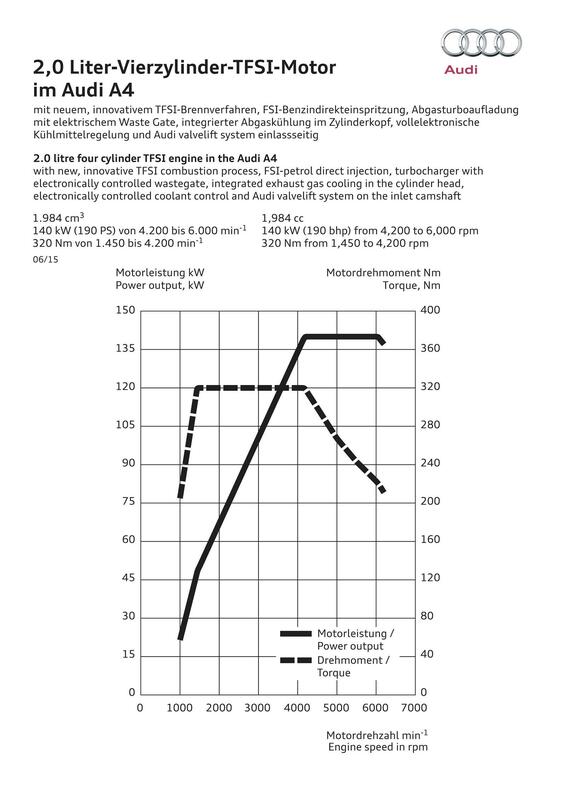 In the NEDC (New European Driving Cycle), the 1.4 TFSI with S tronic consumes only 4.9 liters per 100 kilometers (48.0 US mpg) in the A4 Sedan, resulting in CO2 emissions of 114 grams per kilometer (183.5 grams per mile). 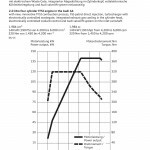 Compared with the 1.8 TFSI of the previous model, fuel consumption has been reduced by 21 percent. With its aluminum crankcase, the new four-cylinder engine weighs just over 100 kilograms, despite its highly complex technology package. The valve-drive module in the cylinder head is designed to be light and rigid. Below it, the exhaust manifold is integrated into the cylinder head – a key element of efficient thermal management. Like the crankcase, the cylinder head has its own cooling circuit. The entire crankshaft drive has a very low mass and frictional losses. The turbocharger and its peripherals are optimized in all details to build up boost pressure rapidly. With the mixed-flow turbine wheel, the moment of inertia is low, the electrically operated wastegate works extremely precisely and intercooler integrated into the intake manifold results in short distances for the gas mixture to travel. The common rail system develops an injection pressure of up to 200 bar; the toothed belt for valve timing and auxiliary drive is designed to last for the engine’s lifetime. 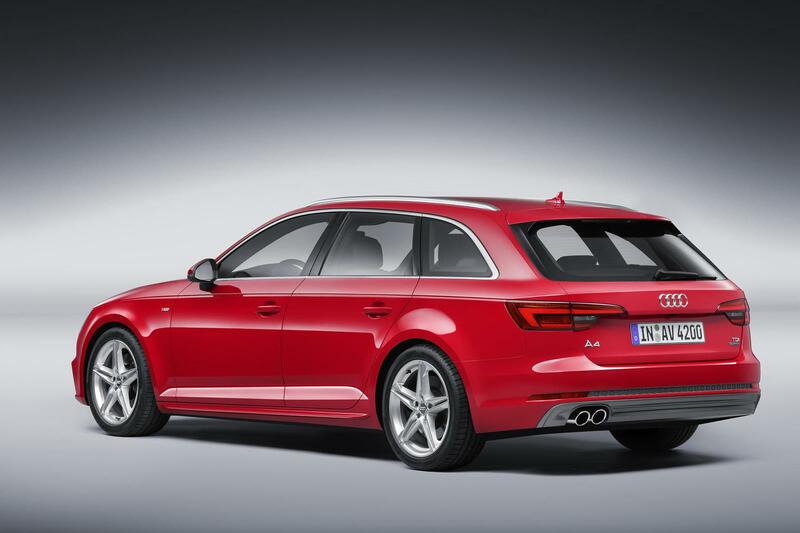 The 2.0 TFSI with a displacement of 1,984 cc is available in two versions for the Audi A4 and A4 Avant. Its technical refinements are the exhaust manifold integrated into the cylinder head, the rotary-valve model for thermal management, the Audi valve-lift system (AVS) for the outlet valves, the electric wastegate of the turbocharger and the dual fuel injection. In partial load, indirect injection in the inlet manifold supplements the FSI direct injection. In the high-end version, the 2.0 TFSI delivers 185 kW (252 hp) and torque of 370 Nm (272.9 lb-ft) between 1,600 and 4,500 rpm. 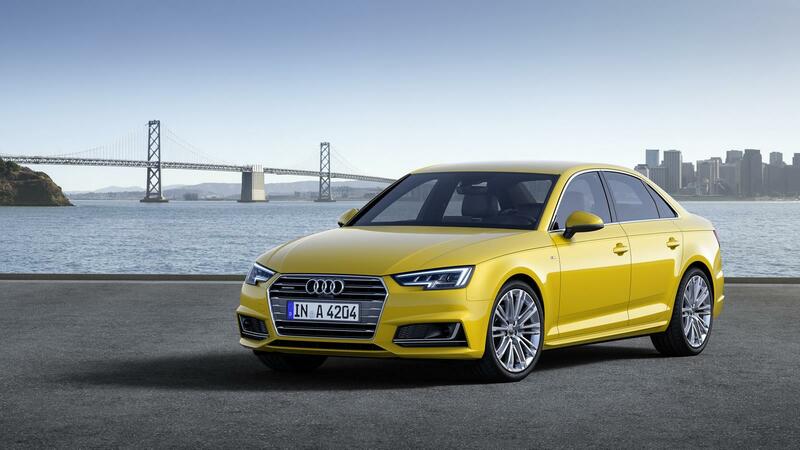 This allows sporty driving: The new A4 Sedan with quattro drive and seven-speed S tronic sprint from 0 to 100 km/h (0 to 62.1 mph) in 5.8 seconds and has an electronically limited top speed of 250 km/h (155.3 mph). 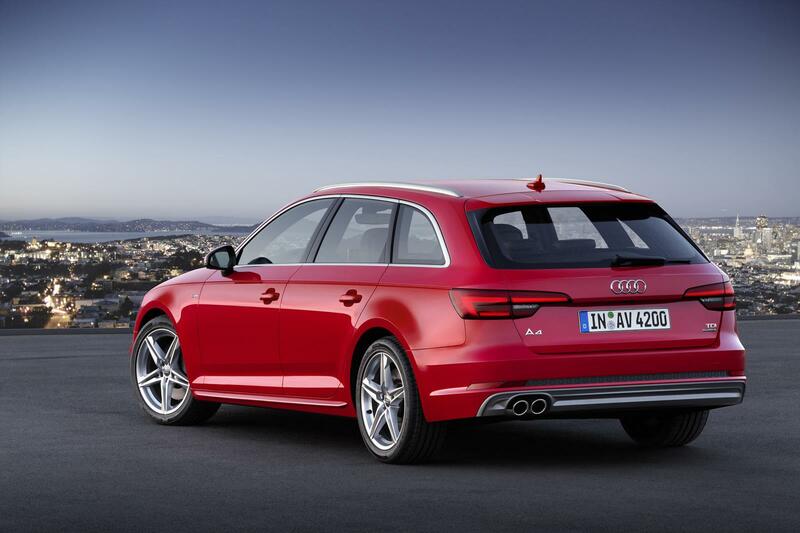 The new A4 Avant has corresponding figures of 6.0 seconds and 250 km/h. The Sedan with front-wheel drive and S tronic consumes just 5.7 liters of fuel per 100 kilometers in the NEDC (41.3 US mpg) and emits 129 grams of CO2 per kilometer (207.6 grams per mile). The second version of the 2.0 TFSI, the gasoline ultra model, delivers 140 kW (190 hp) and torque of 320 Nm (236 lb-ft) between 1,450 and 4,200 rpm. This also results in very agile performance: 7.3 seconds from 0 to 100 km/h (62.1 mph) and a top speed of 240 km/h (149.1 mph) for the Sedan; 7.5 seconds and 238 km/h (147.9 mph) for the Avant (both with S tronic). NEDC fuel consumption is excellent: The Sedan consumes 4.8 liters per 100 kilometers (49 US mpg) and the Avant 5.0 liters (47 US mpg), equivalent to 109 and 114 grams of CO2 per kilometer (175.4 and 183.5 grams per mile) respectively. These results are based on a new strategy – Audi continues to develop its successful engine downsizing into rightsizing. The pioneering efficiency of the 2.0 TFSI is the result of an innovative combustion method whereby the comparatively large engine displacement is not a handicap, but a prerequisite. With a moderate driving style, customers of new Audi A4 and A4 Avant experience the economical advantages of a small engine, but do not feel its disadvantages when driving in a more sporty manner. The new combustion method with shorter compression and longer expansion phases as well as increased compression is designed especially for partial load, by far the most common mode of operation. The intake valves close much earlier than usual; in connection with increased pressure in the intake manifold, this reduces throttling losses during aspiration. Due to the shortened compression phase, the compression ratio was successfully increased from 9.6:1 to 11.7:1. This means that in the compression phase, the engine only has to compress as much gas as a 1.4 TFSI. Also in the expansion phase, in which it fully utilizes its two liters of displacement, it profits from the high compression ratio; the resulting higher level of pressure during combustion further increases the engine’s efficiency. In order for the fuel-air mixture to swirl sufficiently despite the short intake time, the combustion chambers, piston recesses, intake ducts and turbocharging of the new 2.0 TFSI are specially adapted to the new combustion method. Under higher loads, the Audi valvelift system opens the intake valves later, resulting in a higher charge, which ensures good power and torque delivery. Injection pressure has been increased to 250 bar. As with the TFSI engines, Audi offers the four-cylinder TDI engines with its displacement of 1,968 cc in two power versions. The first delivers 110 kW (150 hp) and torque of 320 Nm (236 lb-ft) between 1,500 and 3,250 rpm; the second delivers 140 kW (190 hp) and torque of 400 Nm (295 lb-ft) between 1,750 and 3,000 rpm. 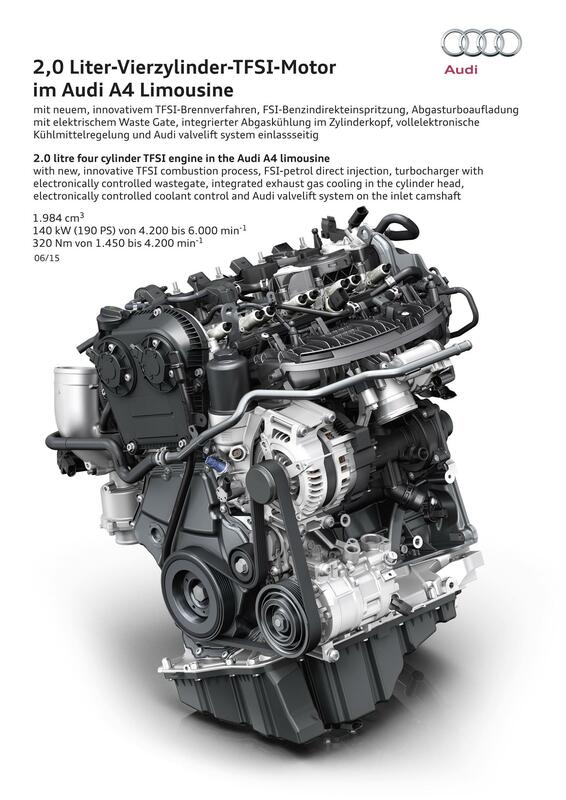 The 2.0 TDI clean diesel features several sophisticated technical solutions – with separate cooling circuits, two balancing shafts in the crankcase, a cylinder-pressure sensor, substantially reduced inner friction and a common-rail fuel injection system with a maximum pressure of 2,000 bar. Emissions stay low thanks to high- and low-pressure exhaust-gas recirculation and multi-stage exhaust-gas aftertreatment including an SCR system (selective catalytic reduction). 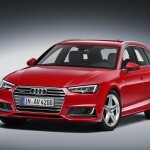 Even the less powerful version with 110 kW ensures high performance: The A4 Sedan with seven-speed S tronic and front-wheel drive accelerates from zero to 100 km/h (62.1 mph) in 8.7 seconds and has a top speed of 219 km/h (136.1 mph); the corresponding figures for the A4 Avant are 9.0 seconds and 213 km/h (132.4 mph). In combination with the manual six-speed transmission, the Sedan and the Avant have fuel consumption of just 3.8 and 4.0 liters per 100 kilometers (61.9 and 58.8 US mpg) and emissions of 99 and 104 grams of CO2 per kilometer (159.3 and 167.4 grams per mile). 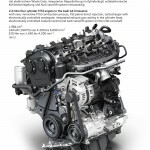 In the version with 140 kW (190 hp), the 2.0 TDI clean diesel is also a highly efficient engine. 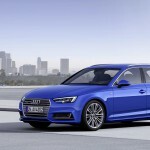 With it, the new A4 Sedan with seven-speed S tronic and front-wheel drive has NEDC fuel consumption of 4.1 liters per 100 kilometers (57.4 US mpg) and CO2 emissions of 107 grams per kilometer (172.2 g/mi). 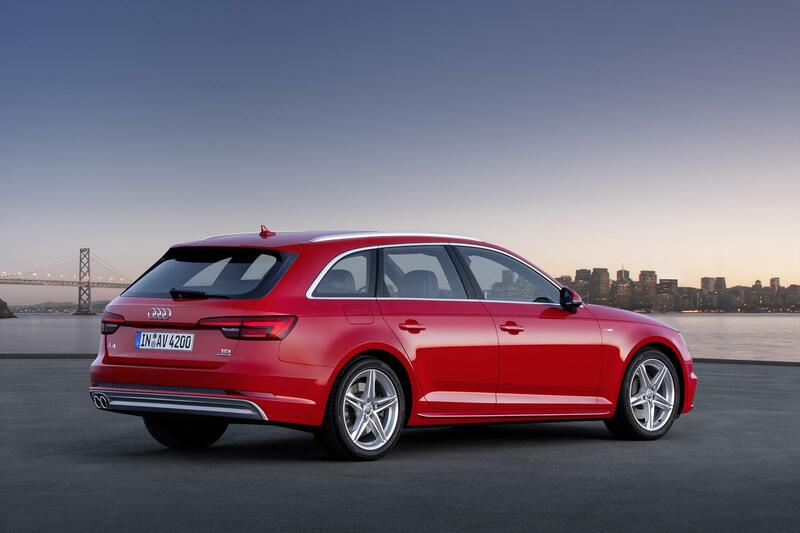 The new A4 Avant consumes 4.2 l/100 km (56 US mpg) and emits 109 g/km of CO2 (175.4 g/mi). 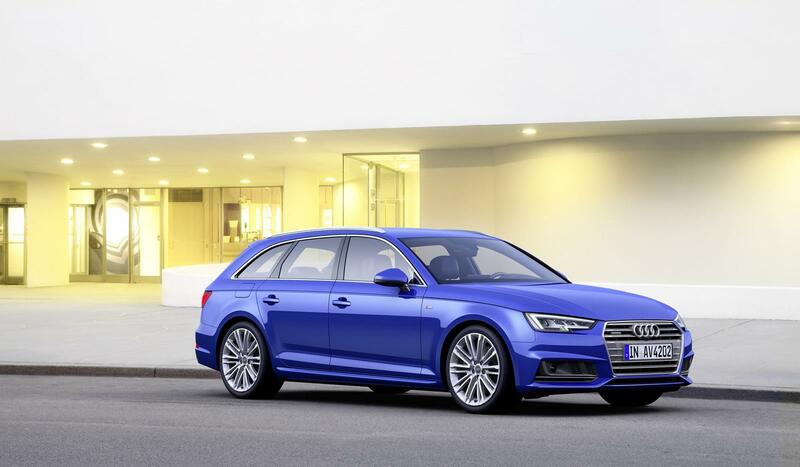 The powerful four-cylinder diesel engine also delivers an impressive performance: acceleration from 0 to 100 km/h (62.1 mph) with front-wheel drive and S tronic in 7.7 seconds for the Sedan and 7.9 seconds for the Avant; top speeds of 237 km/h (147.3 mph) and 231 km/h (143.5 mph) respectively. The two 2.0 TDI engines will also be available as “ultra” versions – a badge that signifies the most efficient version of each model series. Modifications to the transmission ratio, bodywork and suspension as well as the use of tires with optimized roll resistance reduce fuel consumption even further. The A4 ultra with manual transmission and 110 kW (150 hp) has NEDC fuel consumption of just 3.7 liters per 100 kilometers (63.6 US mpg) and CO2 emissions of 95 grams per kilometer (152.9 g/mi); the corresponding A4 Avant ultra consumes 3.8 l/100 km (61.9 US mpg) and emits 99 g/km CO2 (159.3 g/mi). No competitor in the premium segment has better figures. Another 2.0 TDI engine will be added after the market launch with power output of 90 kW (122 hp). The two six-cylinder TDI engines in the new A4 family are highly distinctive: They combine superior power with the utmost smoothness and efficiency. The 3.0 TDI clean diesel with displacement of 2,967 cc is available with power output of 160 kW (218 hp) of 200 kW (272 hp). The three-liter diesel engine, which weighs only 190 kilograms, incorporates numerous high-tech solutions: particularly complex thermal management, new cylinder heads, substantially reduced friction, a modified chain drive and an electrically adjustable turbocharger that delivers a pressure boost of up to 2.0 bar. The exhaust-gas aftertreatment system is installed directly on the rear of the engine, and its innovative NOx trap catalyst works in conjunction with an SCR-coated diesel-particulate filter. In the first version, the 3.0 TDI clean diesel delivers 160 kW (218 hp). Its torque of 400 Nm (295 lb-ft) is available from 1,250 to 3.750 rpm. 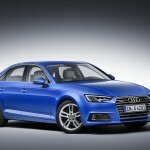 The A4 Sedan and Avant with front-wheel drive are projected to have NEDC fuel consumption of just 4.2 liters per 100 kilometers (56 US mpg), equivalent to CO2 emissions of 110 grams of CO2 per kilometer (177 grams per mile); these are provisional figures. This makes the TDI the world’s most efficient six-cylinder engine. In the high-end version, the 3.0 TDI clean diesel has a maximum output of 200 kW (272 hp) and delivers 600 Nm (442.5 lb-ft) of torque between 1,500 and 3,000 rpm. It accelerates the A4 Sedan like a sports car – in just 5.3 seconds from zero to 100 km/h (62.1 mph) – and easily reaches the electronically limited top speed of 250 km (155.3 mph). However, its NEDC fuel consumption is just 4.9 liters per 100 kilometers (48 US mpg) and it emits only 129 grams of CO2 per kilometer (207.6 g/mi). The figures for the A4 Avant are 5.4 seconds, 250 km/h (155.3 mph), 5.1 liters per 100 kilometers (46.1 US mpg) and 134 grams of CO2 per kilometer (215.7 g/mi). The Audi A4 Avant g-tron is the second model after the A3 Sportback g-tron that customers can run on compressed natural gas (CNG) or Audi e-gas. Its 2.0 TFSI engines has an output of 125 kW (170 hp) and torque of 270 Nm (199.1 lb-ft). The tanks for the Avant g-tron, which will become available in late 2016, are located under the rear of the car. They can hold 19 kilograms (41.9 lb) of gas at a pressure of 200 bar and are particularly light thanks to their novel layout. The inner layer consists of a matrix of gas-proof polyamide, while a second layer of mixed carbon-fiber-reinforced plastic (CFRP) and glass-fiber-reinforced plastic (GFRP) ensures extremely high strength. The third layer made of glass fiber helps visualize any external influences. Epoxy resin is used to bind the fiber materials. Gas consumption of less than four kilograms per 100 kilometers (8.8 lb per 62.1 miles) in a normal driving cycle means extremely low fuel costs for the customer. With NEDC fuel consumption, the bivalent g-tron model drives over 500 kilometers (310.7 mi) on natural gas. When the gas left in the tank is less than about 0.6 of a kilogram (1.3 lb), gas pressure, falls below ten bar and the engine management automatically switches over to gasoline operation. This allows an additional range of 450 kilometers (279.6 mi). 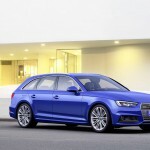 The A4 Avant g-tron is particularly ecofriendly when it runs on Audi e-gas. With this fuel, the company presents the first form of completely CO2-neutral long-distance mobility. Audi produces this fuel with the help of renewable energy, water and CO2 in several power-to-gas plants. Using this method, the brand with the Four Rings makes surpluses of renewable energy storable. The e-gas can be bought with a special filling-station card, which acts as a compensation instrument. Manual transmission, S tronic and tiptronic, front-wheel and quattro drive – there are various solutions for power transmission in the new A4 models. Tailored technology is available for each engine. The manual transmission, which is standard equipment for all TFSI engines and for the four-cylinder TDI engine, is an all-new development. Much of its housing is made of magnesium. A spur-gear stage replaces the shaft to the front-axle differential used on the previous model, providing great advantages in terms of friction and space requirements. Open gearwheels, hollow shafts and a smaller clutch reduce the transmission’s weight further with the end result that the new unit is 16 kilograms (35.3 lb) lighter than the old one. Audi’s new seven-speed S tronic is available for all engines except the top TDI and is standard equipment for the 3.0 TDI clean diesel with 160 kW (218 hp). The dual-clutch transmission, which replaces the continuously variable multitronic transmission, features excellent efficiency. The most important improvements are a further reduction in friction, the low weight, highly efficient oil lines and a centrifugal pendulum-type absorber on the dual-mass flywheel which allows very low idling speeds. The two compact multi-disc clutches of the new seven-speed S tronic are arranged axially behind each other instead of – as with the predecessor – radially above each other, which reduces drag torque. They operate two separate sub-transmissions, which are constructed like manual transmissions. They are permanently active but only one of them is connected to the engine. Gear shifts take place within a few hundredths of a second by means of clutch operations, and with virtually no interruption of traction. With the quattro transmissions, power is transmitted from the drive shaft through a spur-gear stage to the front-axle differential. 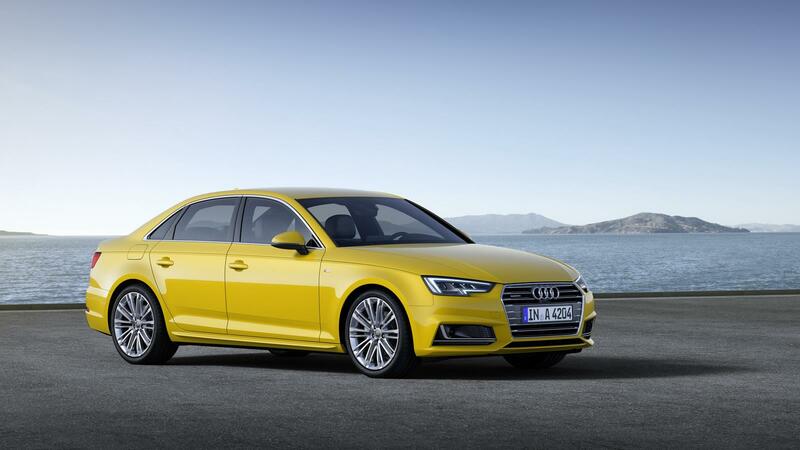 The eight-speed tiptronic is available only with the 3.0 TDI clean diesel with 200 kW (272 hp). The smooth, rapid and spontaneously shifting torque-converter transmission is another all-new development. Its high number of gears allows the engine to be operated close to its ideal load for more of the time. A new engine-speed-adaptive vibration absorber allows the powerful V6 diesel engine to run smoothly even at just 850 rpm. The design of the gear sets and shifting elements ensures low drag torque, which results in high efficiency. Both automatic transmissions in the new A4 series are state of the art and feature a wide spread of gears: Their lower gears have sporty low ratios and high ratios for the upper gears to reduce engine speed and fuel consumption. The S tronic and the tiptronic are integrated into the engine’s thermal management and designed for start-stop operation. The driver can select between modes D, S and E and can manually shift gears at any time with the selector lever or with the standard shift paddles on the steering wheel. All the driver’s inputs are transmitted to the transmission electrically (“by wire”), a quick tap on the selector lever triggers the shift command. The new cruise control includes an impressive efficiency function: When the driver lifts his or her foot from the accelerator pedal in mode D or E, the transmission shifts to freewheeling whenever that would result in fuel savings. This coasting mode is possible between 55 and 160 km/h (34.2-99.4 mph). The function can anticipate even more effectively when a car has the optional systems predictive efficiency assist and Stop&Go adaptive cruise control including traffic-jam assist. 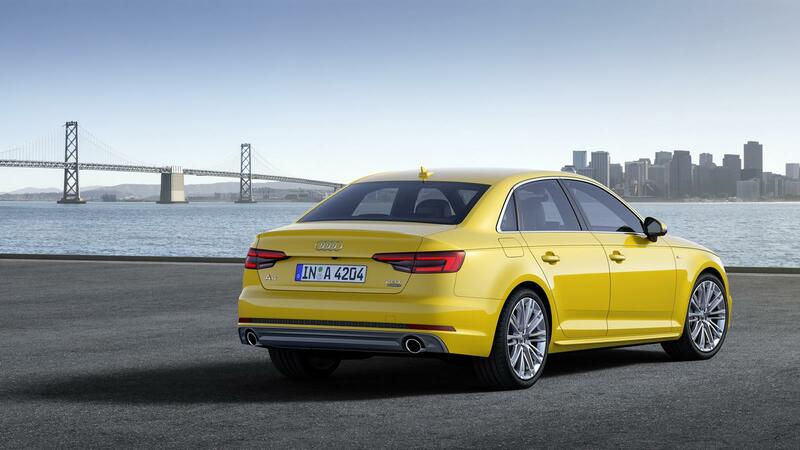 Front-wheel drive is standard equipment in the new Audi A4 family. With the gasoline engines, quattro permanent all-wheel drive is available for the 2.0 TFSI with 185 kW (245 hp). For the diesel engines it is available as of the 2.0 TDI with 140 kW (190 hp) and is standard equipment for the most powerful 3.0 TDI with 200 kW (272 hp). Audi’s quattro all-wheel drive is the ultimate in terms of dynamics, traction, safety and straight-line reliability. It is a purely mechanical system and therefore operates without any delay. 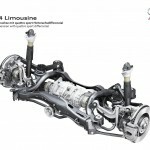 In normal operation, its self-locking central differential, which is designed as a planetary gear train, transfers 60 percent of the engine’s torque to the rear axle and 40 percent to the front. Depending on the situation, up to 70 percent of the torque can be transferred to the front and up to 85 percent to the rear. These high limits allow a clearly defined torque distribution and extremely precise interaction with the control systems. The further developed wheel-selective torque control is a drivetrain “partner” and is now active on all road surfaces. During dynamic cornering, the software function slightly brakes the front wheel on the inner side of the curve (with front-wheel drive) or both inner wheels (with quattro drive) before wheelspin occurs. This also takes place when the drier is not pressing the accelerator. Due to the different forces, the car turns slightly into the curve; the roll-steer effect remains neutral for longer and the car’s handling is more precise, agile and stable. 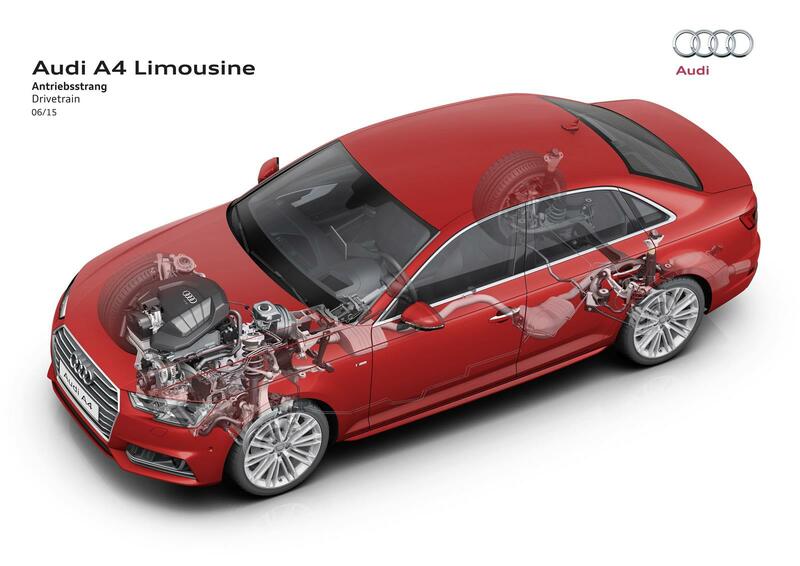 The sport differential, optional for the top TDI as of 2016, optimizes handling. It actively splits torque between the rear wheels through two stages. During sportier driving, the system literally pushes the car into the curve, eliminating any tendency to understeer. This function, which is managed by a newly developed control unit – the electronic suspension program – is integrated into Audi drive select. The sport differential reacts faster than that of the previous model and is approximately one kilogram lighter. 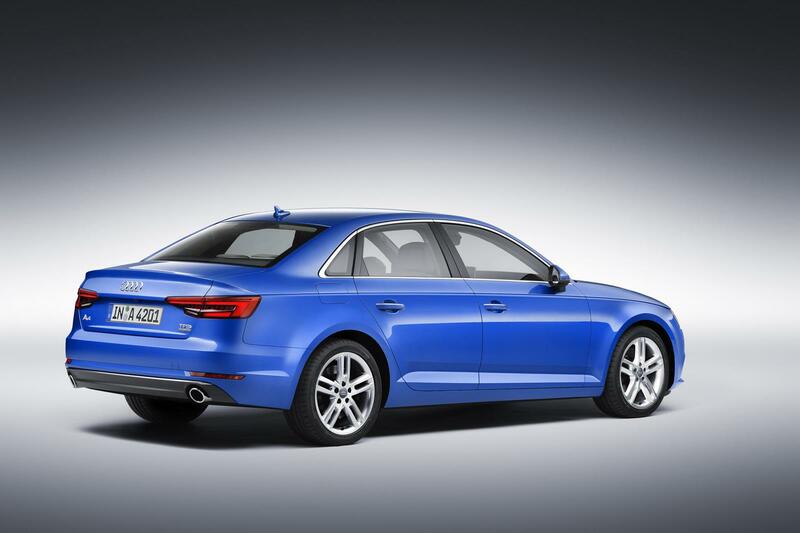 Strong driving dynamics are an important feature of the Audi A4. Within its segment, both sporty driving pleasure and comfort are key factors with regard to suspension tuning. An A4 is designed to be fun to drive on winding roads as well as being an ideal automobile with its excellent ride comfort for long distances. These properties are based not least on the precise electromechanical steering and the newly developed five-link front and rear axles. An additional advantage is that driving dynamics can be adjusted to each situation. Audi drive select influences the mapping of the power steering and accelerator pedal as well as the optional variable suspension. 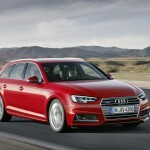 This makes the A4 highly confident on highways and agile on winding country roads. 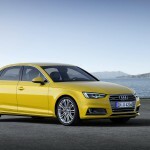 Audi’s decision to install variable shock absorbers makes the car more distinctive in terms of ride comfort as well. For the first time, the driver can select between two suspension settings. One of them is tuned for a more sporty and dynamic driving style, while the other has its emphasis more on comfort. 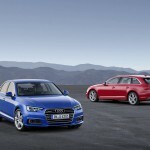 The new A4 and A4 Avant blend great talents: dynamic handling and a comfortable ride approaching the level of the next higher automobile category. 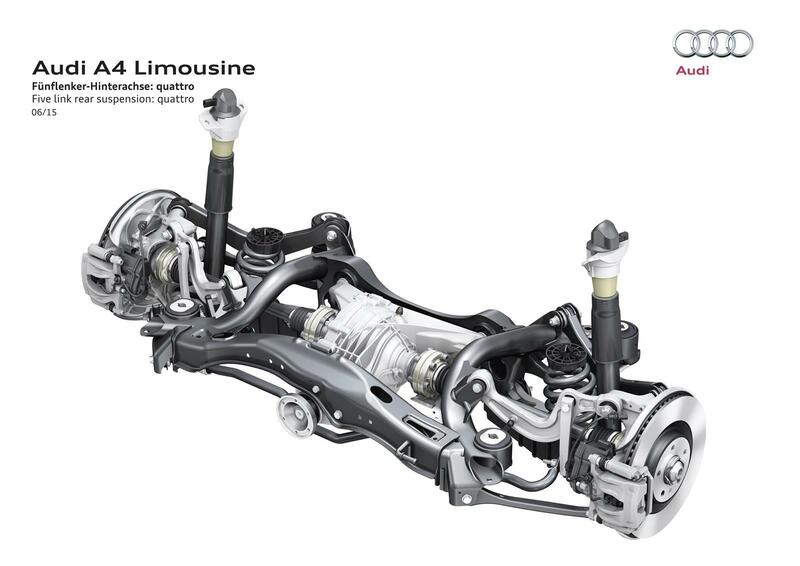 The Audi engineers developed a new suspension system for this model series with a focus on systematic lightweight construction and precise responses. 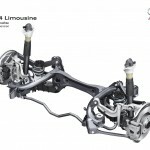 A further enhanced five-link front axle is used, the principle of which allows optimal absorption of longitudinal or lateral forces. The mounts are designed to be stiff and sporty in the lateral direction but smooth and soft in the longitudinal direction. Vibrations are consistently eliminated with the use of a hydromount, which ensures excellent comfort along with a high degree of agility. In order to achieve optimal stiffness, the upper links are integrated directly into the bodywork, unlike on the previous model. All axle links, the pivot bearing and the damper stilts are made of forged aluminum. The lightweight concept is completed with the use of monotube dampers and high-strength, thin-wall tubular stabilizer bars and segmented wheel hubs. Compared with the previous model, the weight of the front axle has been reduced by six kilograms. 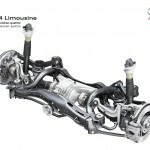 The lower link level is attached with newly designed rubber mounts to a hybrid subframe made of high-strength and aluminum. The stiff installation of the subframe in the front of the body minimizes vibrations and provides the foundation for optimal agility. Audi also decided on all-new electromechanical power steering, saving 3.5 kilograms (7.7 lb) compared with the previous model. It consumes very little energy and has a direct, sporty ratio of 15.9:1. Power assistance is based on the car’s current speed. The steering provides very exact feedback from the road, responds spontaneously and is very precise. The new electromechanical power steering is functionally connected with some of the new driver assistance systems such as the Stop&Go adaptive cruise control including traffic-jam assist. Dynamic steering is available In combination with engines of 110 kW (150 hp) and above. Through the use of superimposed gearing, its ratio varies by up to 100 percent, depending on the car’s speed and the mode selected in the Audi drive select driving dynamics system. Vehicle stabilization is supported by lightning-fast steering impulses, further enhancing stability and safety. 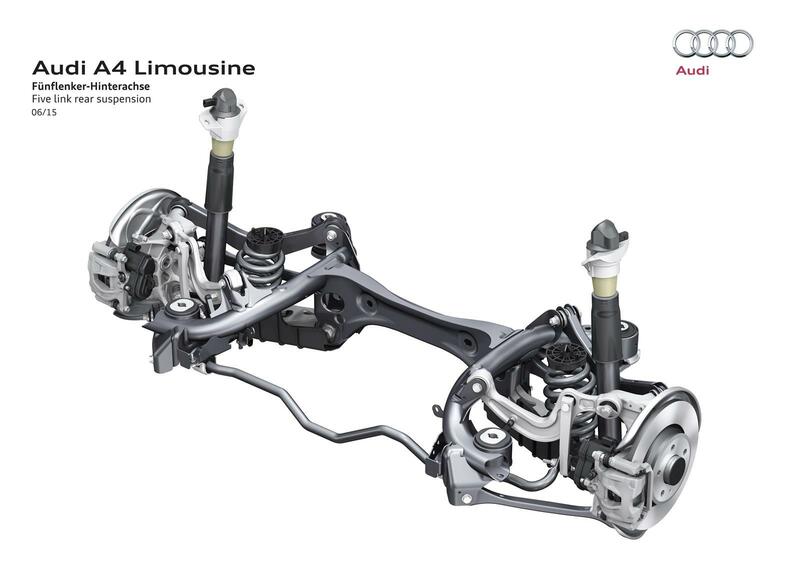 In the rear of the new Audi A4 and A4 Avant, a five-link axle replaces the trapezoidal-link axles of the previous model. By means of an intelligent combination of materials, the weight of the axle components has been reduced by another five kilograms. Low unsprung mass provides a sporty driving experience, and together with the new damper and elastomer tuning, it allows a smooth ride, excellent body control and improved wheel damping and control. For the first time, monotube shock absorbers have been used, resulting in a further weight reduction. The axle is insulated from the body with hydraulically damped axle mounts. This reduces the shocks from the road surface significantly while maintaining lateral guidance. Additional measures for the reduction of fuel consumption are friction-optimized wheel bearings and aero-deflectors that reduce roll and wind resistance. A central suspension control system has been applied to achieve ideal interaction between the various driving dynamics systems. 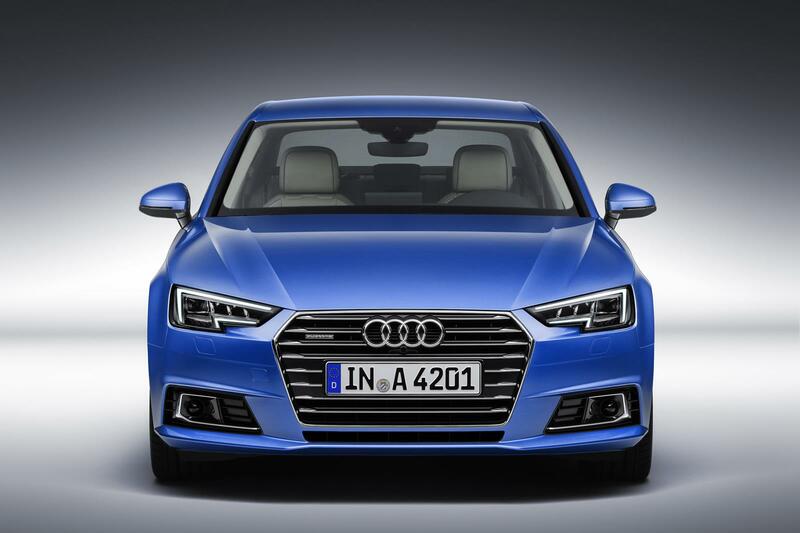 This highly integrated control device was specially developed for the new A4. It processes all the information relevant for driving dynamics, from which it calculates the driving situation and the current road surface frictional coefficient. This information allows optimal control of the system for highly precise, dynamic handling and maximum ride comfort. 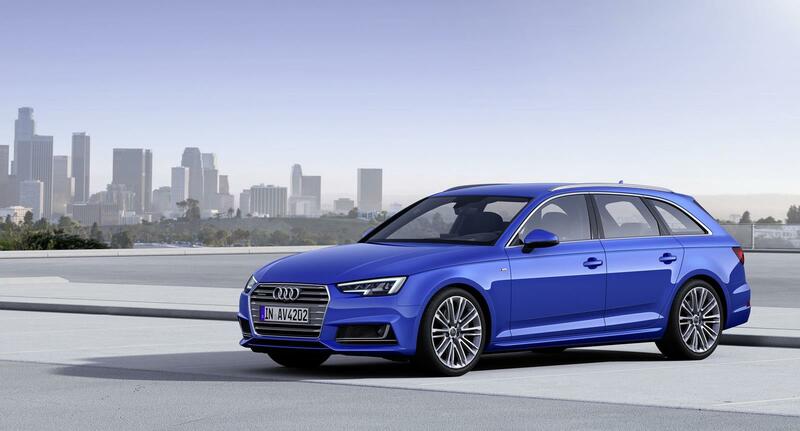 As an alternative to the standard tuning with highly sensitive monotube shock absorbers, Audi has equipped the new A4 and A4 Avant with two suspension systems that utilize variable damping; one focuses on comfort and the other on sporty driving. Sensors measure the movement of all four wheels as well as longitudinal and transverse acceleration. The shock absorbers are then adjusted to the road-surface conditions and driving situation accordingly. This results in enhanced driving dynamics with even more comfort. In addition, the driver can choose the basic suspension setting by pressing a button in Audi drive select, so that the desired characteristics are always available. This is made possible with newly developed CDC (continuous damping control) shock absorbers with electromagnetically controlled valves in their pistons. They allow hydraulic fluid to flow faster or more slowly as required. A new operating concept makes them very energy efficient. The central suspension control unit processes all sensor signals within milliseconds and controls each shock absorber individually. Together with the wide range of the damper valves, this ensures a wide spectrum between a soft rise and firm handling. When suspension with variable shock absorbers is installed, the car body is 10 millimeters (0.4 in) lower than with a normal suspension in the comfort setting and 23 millimeters (0.9 in) lower in the sport setting. 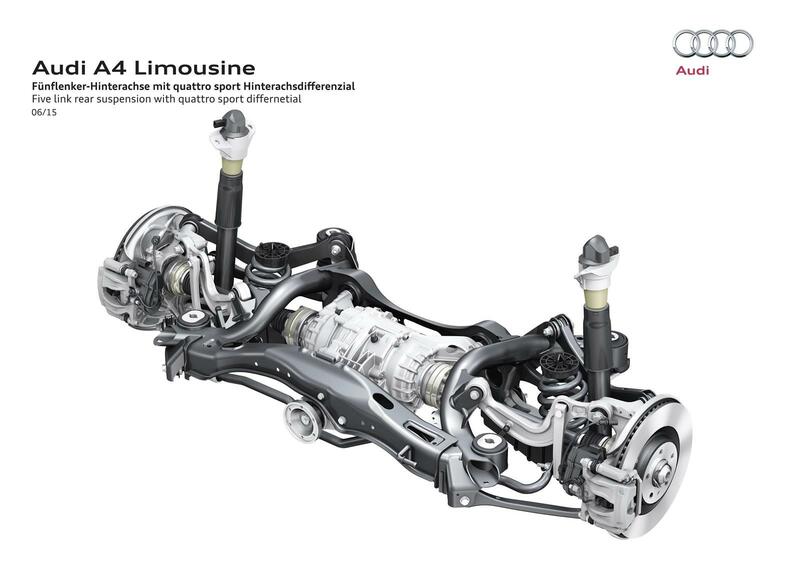 Like the suspension with variable shock absorbers, quattro drive with sport differential (available as of 2016) and dynamic steering belong to the optional components for the new A4 family whose control is included in the optional Audi drive select system (standard equipment as of 140 kW/190 hp). In the basic configuration, the driver can use this system to regulate the behavior of accelerator pedal, automatic transmission, steering, cruise control or adaptive cruise control (ACC) and automatic air-conditioning in various modes, named Comfort, Auto, Dynamic and Efficiency. In connection with a navigation system, there is also the mode Individual, with which the driver can adjust each system as desired. 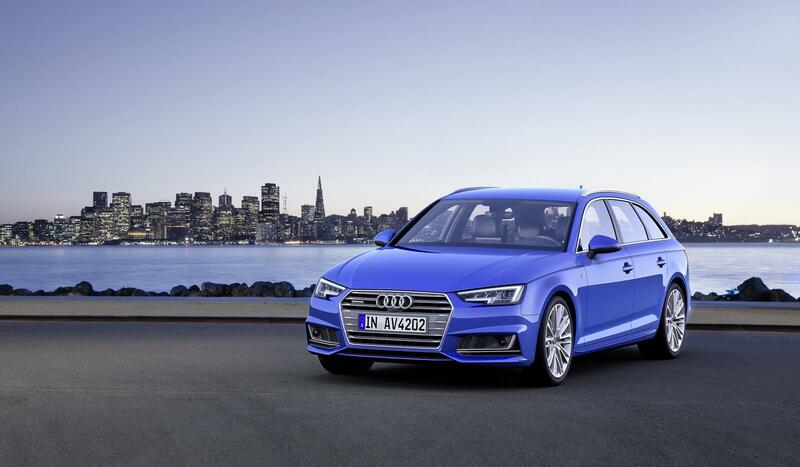 Standard equipment for the new A4 and A4 Avant in the base line includes 16‑inch or 17-inch light-alloy wheels (depending on the engine); 17-inch cast aluminum wheels are fitted with the design and sport lines. Audi and quattro GmbH offer optional wheels ranging from 18-inch cast aluminum flow-forming wheels (standard equipment with the S line sport package and with design selection) to 19-inch diameter. An aerodynamically optimized version is offered of the 16 and 17-inch wheels. All the wheels Audi offers for the A4 are extremely light and their low unsprung mass contributes to the sporty driving experience. All tires have optimized roll resistance. A repair set and tire-pressure monitoring are standard equipment with the option of a space-saving reserve wheel. A wide range of brakes are fitted on the various models. The A4 models with the TDI engine up to 120 kW (163 hp) and the TFSI up to 140 kW (190 hp) and 16‑inch wheels have brake discs with floating calipers. The models with the most powerful engines and 17-inch wheels have brake discs with especially light fixed aluminum calipers. The new brakes are approximately five kilograms (11 lb) lighter than those of the previous models. The front axles are fitted with internally ventilated brake discs of up to 338 millimeters (13.3 in) in diameter. The electromechanical parking brake is integrated into the rear axle and features new holding and starting functions. Many aspects of the Electronic Stabilization Control (ESC) have been further developed; it now operates with even more precision and sensitiveness than on the previous model. In the dynamic mode, engine intervention is largely deactivated and brake intervention is slightly reduced. 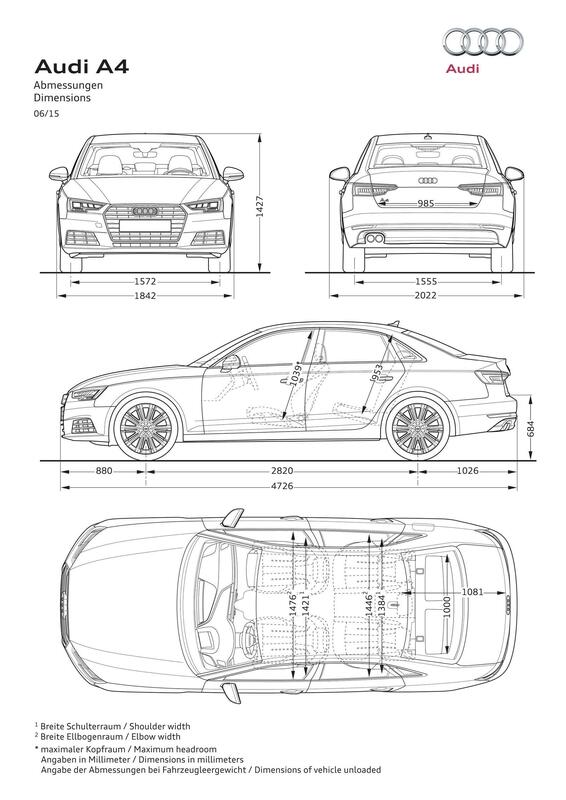 The length of the Sedan version of the new A4 is 4,726 millimeters (186.1 in), which is 25 millimeters (1 in) longer than the previous model. Its width has grown by 16 millimeters (0.6 in) to 1,842 millimeters (72.5 in) and its height is unchanged at 1,427 millimeters (56.2 in) – the lowest in the premium segment. 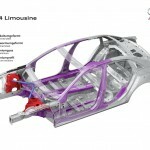 Its wheelbase has grown by 12 millimeters (0.5 in) to 2,820 millimeters (111 in). 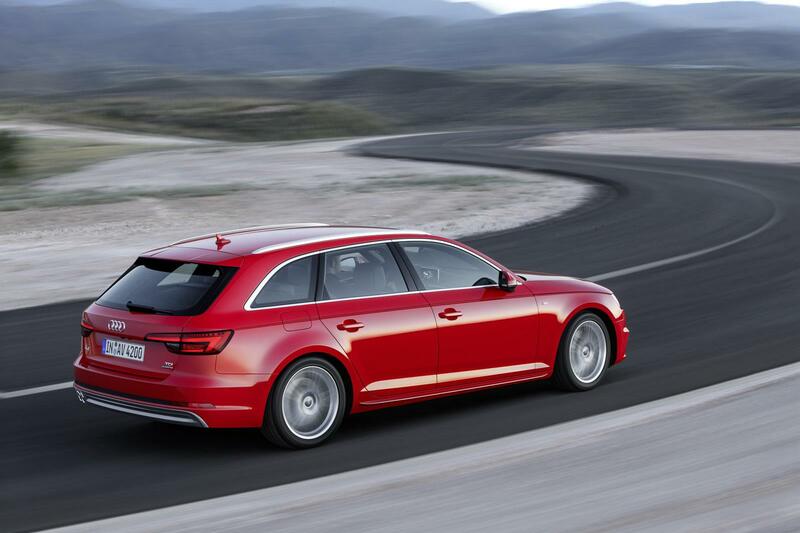 The new Audi A4 Avant is one millimeter (0.0 in) shorter and seven millimeters (0.3 in) higher than the Sedan; all other dimensions are identical. 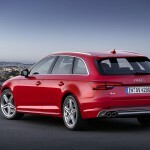 Audi’s designers have given the A4 Sedan and A4 Avant a striking appearance with balanced and harmonious proportions. With a shape that is both technoid and elegantly sporty, the brand with the Four Rings has once again designed an impressive automobile. At the front, horizontal lines and the wrap-around hood emphasize the car’s width; the dominating element is a broader and lower Singleframe grille with a prominently contoured lattice structure. The headlights ensure unmistakable lighting graphics with their serrated lower edges. Fiber optics form two sharp angles for the daytime running lights and – at their upper edges – the turn indicators. Xenon plus units are standard equipment and Audi also offers LED headlights as well as matrix LED headlights. With both options, the low beam resembles an eye; its eleven light diodes require only 20 watts of power. The turn indicators and all-weather lights are positioned below. The full beam of the matrix LED headlights is produced by twelve LEDs with three reflectors. The camera on the interior mirror provides the data, and the control unit switches them on and off individually as required or dims them in 64 stages. In this way, the matrix LED headlights distribute light in several million possible combinations. No matter how they are set, they illuminate the road with a light quality similar to daylight, but without blinding other road users. Light is directed at those signs with reduced intensity to ensure that the driver is not blinded by the strong reflections of road signs. The bend lighting of the matrix LED headlights is created by shifting the light’s main focus. In combination with the optional MMI Navigation plus, it comes into action before the steering wheel is turned thanks to the predictive route data. The dynamic indicators use a series of light diodes switched sequentially from inside to outside in the direction of turn, clearly signaling the car’s direction to other road users. Elegant, logical and harmonious – the flowing lines along the sides of the new Audi A4 and A4 Avant give them a sporty, elongated appearance. The hood wraps around the upper edges of the fenders and features four pronounced contours. The shoulder line starts at the corners of the headlights and then curves to and wraps around the rear. Along the sides, its undercut creates an intensive interplay of light and shadow. The dynamic line flows gently upward above the door sills, and the wheel wells have a pronounced flare. The body below the lower window line is about twice as high as from the window line to the roof – typical for Audi. The low roof line curves quickly downwards; on the Avant it flows into raked D-pillars. The Avant has black roof rails as standard equipment. The exterior mirrors are mounted on the front doors, as they are on a sports car. 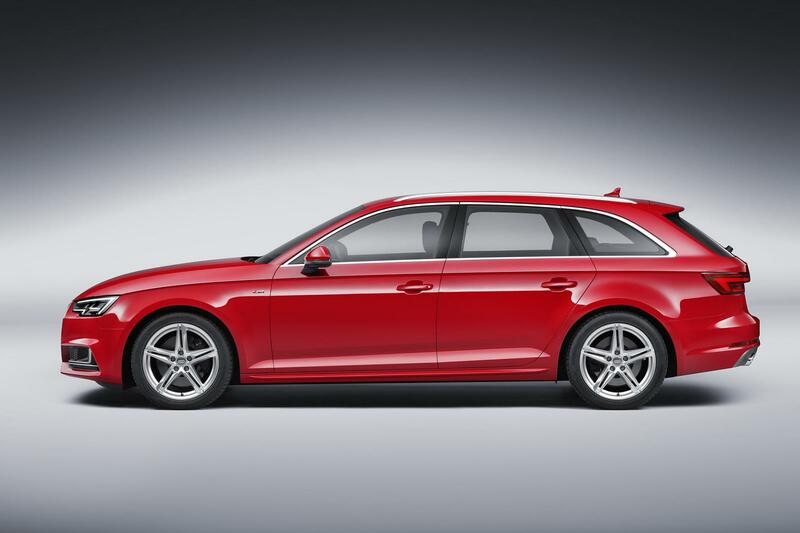 The Sedan’s trunk lid ends in a clearly defined edge, while the Avant has a roof spoiler. The exhaust system leads into a diffusor, single or double, depending on the engine. It terminates in a single tailpipe, a double tailpipe (TDI as of 140 kW/190 hp) or two separate tailpipes (TFSI as of 140 kW/190 hp), which have chromed end pieces in combination with the equipment lines and the 3.0 TDI. Like the headlamps, the rear lights also feature multi-faceted 3D design. With the sharp recesses in the inner corners, their contours are a continuation of the body design, with minor differences between Sedan and Avant. Each unit has 48 LEDs (on equipment versions with LED headlights). The brake lights are placed in the outer lower part of the lights; the dynamic brake light constitutes a strip along the upper edge. The two rear lights are connected with a narrow trim element illuminated by the taillights. 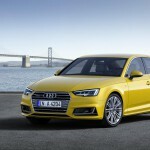 The new Audi A4 and A4 Avant models are available in 15 colors. The two solid paint finishes are brilliant black and ibis white. The metallic and pearl-effect paint finishes are Argus brown, cuvée silver, floret silver, Daytona gray (for the S line sport package), glacier white, Gotland green, Manhattan gray, matador red, moonlight blue, scuba blue, monsoon gray, mythos black and tango red. With the model change of the A4 family, Audi is introducing new, modular equipment lines, giving customers even more choices and also influencing details of the car’s exterior. In addition to the base models, there will be the sport and design lines, as well as the S line sport package and design selection at the top end. 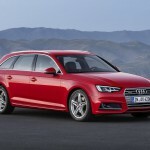 Despite the increased dimensions, the Audi A4 and A4 Avant weigh up to 120 kilograms (264.6 lb) less than the previous models – the base Sedan 1.4 TFSI, which will follow soon after the initial market launch, weighs only 1,320 kilograms (2,910.1 lb) empty and without driver. With this lightweight construction, the body is one of the lightest in its class. It is 15 kilograms (33.1 lb) lighter than its predecessor, thanks to geometrical lightweight construction and an intelligent combination of materials. The module cross member under the dashboard is made of extruded and sheet aluminum, while the front cross member is an extruded profile. 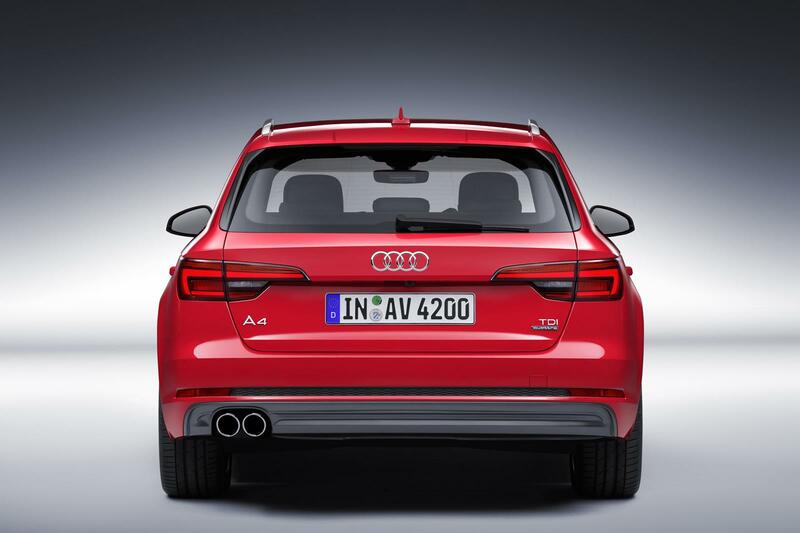 On the new A4 Avant, the nodes in the upper ends of the D-pillars are made of die-cast aluminum and the tailgate is also aluminum. The deep drawing of the tailgate in the press takes place with a device known as and intelligent tool: Laser sensors measure how the sheet metal behaves during the process; if necessary, electrically operated drawing aids make small adjustments to the press. This results in even higher precision in the magnitude of thousandths of millimeters. The mounts for the front MacPherson struts are highly integrated aluminum castings. Compared with components made of sheet steel, which are welded together out of several parts, they reduce weight by a total of eight kilograms. 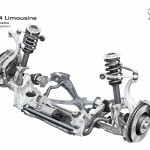 This construction allows a very stiff connection between the upper ends of the struts and the car body, thus ensuring optimal conditions for driving dynamics. 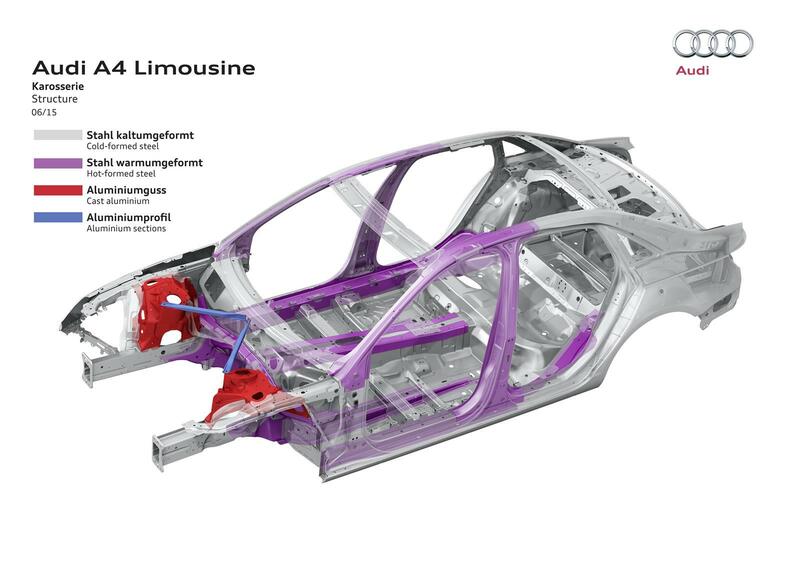 In the new Audi A4 and A4 Avant, the hot-stamped components form the high-strength, crash-proof backbone of the passenger compartment. They strengthen the transition from the front of the car to the interior, the frontal area of the roof frame, the B-pillars, the door sills and parts of the floor. They constitute 17 percent of the body structure. With its excellent torsional rigidity, the bodies of the A4 and A4 Avant lay the foundations for highly precise handling and quiet in the car; the new A4 models surpass their competitors in this respect. Switchable engine mounts ensure exemplary comfort when the engine is idling. The sealing concept for doors and tailgate (on the Avant) is highly complex and an acoustic windscreen is standard equipment. As an option, Audi supplies acoustic glass for the front doors and tinted privacy glass is available for the rear doors. 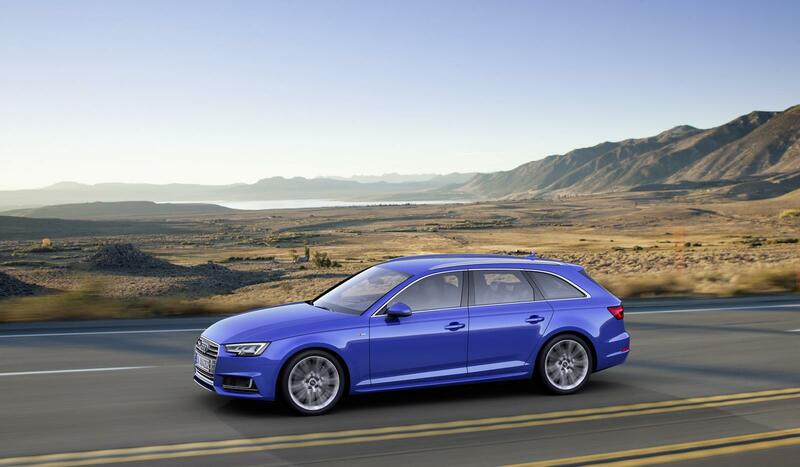 The new Audi A4 and A4 Avant score top marks also for passive safety. In the interior, the adaptive occupant restraint system for the front seats offers outstanding protection. It adjusts the effect of the front airbags and the seat-belt force limiter to the sitting position of the driver and front-seat passenger and to the type of frontal collision. For more than two decades now, the Avant models from Audi have been enjoying growing success; they offer a unique combination of esthetic design and functional utility. 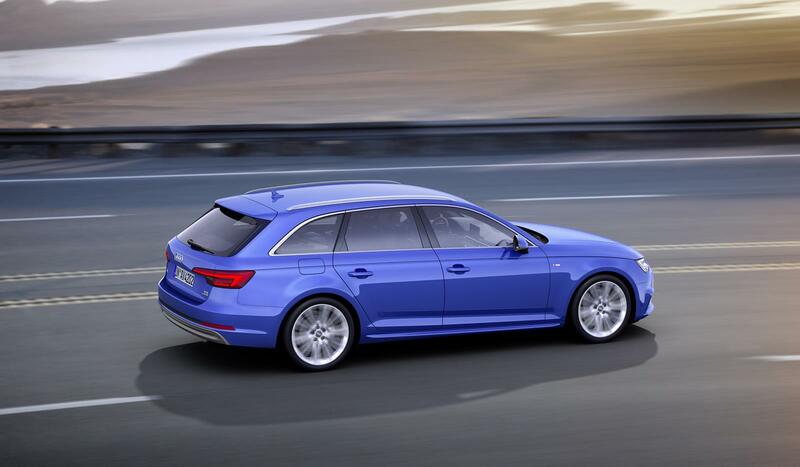 The new A4 Avant continues this tradition – with even more space and elegance. The maximum loading volume adds up to 1,510 liters (69 cu ft) with the rear-seat backrest folded flat. That backrest is split 40:20:40 and can be folded down to the seat cushions using levers in the sides of the luggage compartment. With the rear-seat backrest in the normal position, the Audi A4 Avant offers a loading space of 505 liters, which is 15 liters more than the previous model. The loading sill is just 63 centimeters (24.8 in) high and is scratch-protected by a stainless-steel cover. The loading width is exactly one meter (39.4 in). With its cuboid shape, the luggage compartment offers great utility. A partition net and roof rails are standard equipment, as is the electrical luggage-space cover. Running on rails in the D-pillars, it glides upwards automatically when the tailgate is opened and back down again when it is closed, guaranteeing clear vision through the rear window at all times. If desired, Audi supplies further practical features. They include a variably foldable luggage-compartment mat for dividing up and protecting the loading space, a storage and luggage-compartment package with nets and straps as well as a rail system for highly flexible use of the luggage space. The related load-securing set consisting of a telescopic rod, straps and moveable eyelets can be stored in a recess in the loading floor. The tow-bar unlocks electrically by push-button; the new Audi A4 and A4 Avant are approved for towing trailers of up to 2,100 kilograms (4,629.7 lb) with gradients of up to eight percent. As an option, Audi supplies gesture control for opening the trunk lid of the A4 or the tailgate of the A4 Avant: A proximity sensor in the rear bumper reacts to a kick motion so that the trunk lid or tailgate unlocks and opens automatically when the key is recognized. 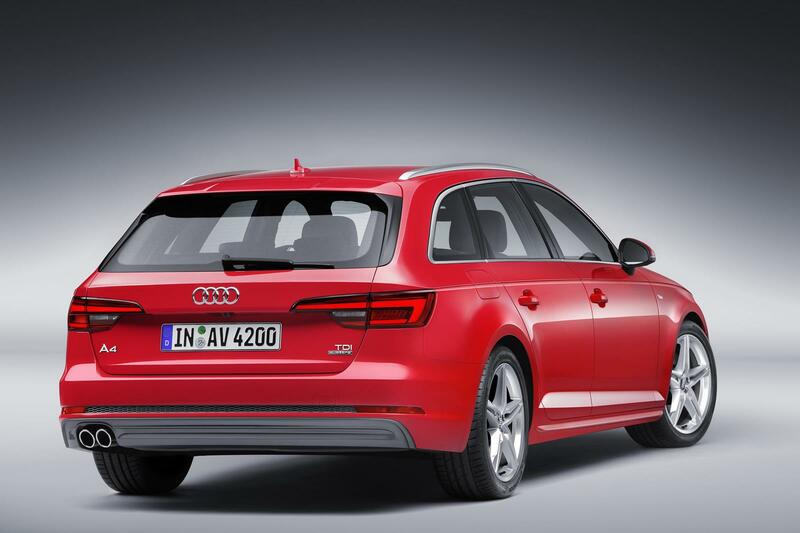 With the A4 Avant, there is also the option of an electric tailgate, which can also be closed by gesture control. There are two buttons in the luggage compartment, one of which closes the tailgate while the other closes the tailgate and also locks the car. In addition, the driver can close the tailgate either with the button in the door or by pressing longer on the button of the convenience key. Remote-control keys and a start-stop button for keyless engine starting are standard equipment on the new A4 and Audi A4 Avant. The convenience key for keyless entry and ignition is an optional extra. The A4 family and its predecessor the Audi 80 have been technological innovators and true winners for many decades. The brand with the Four Rings already set new standards for lightweight construction, performance and agility with the first Audi 80 in the year 1972. Four generations of the Audi 80 were produced until 1994/95, when it was succeeded by the Audi A4. The five-millionth A4 rolled off the assembly line in March 2011 and another production jubilee was celebrated in the fall of the same year: the ten-millionth car in the B segment since 1972. 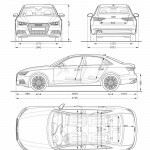 Audi has produced the A4 model family at the company’s main site in Ingolstadt since 1994 and at the plant in Neckarsulm since 2007. The brand’s longstanding bestsellers have always played a major role at Audi, and not only in terms of unit sales. During the 43 years to date, they have showcased great innovations. 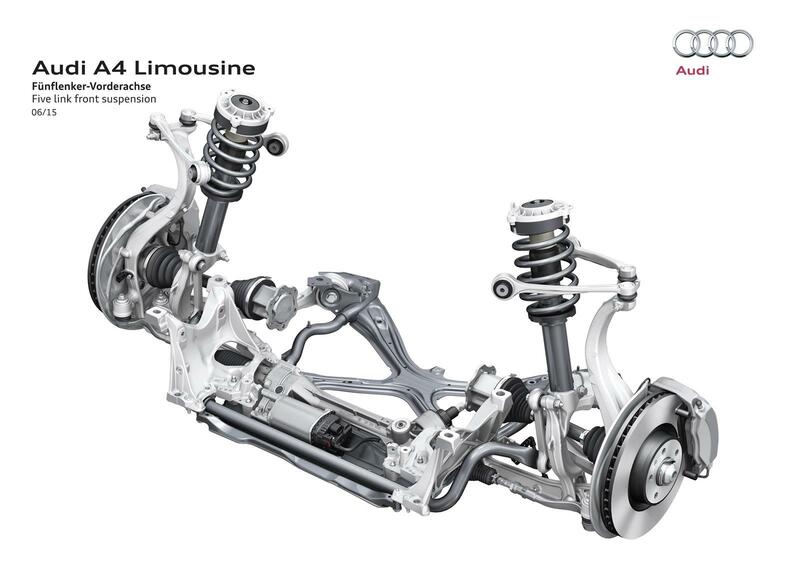 Audi’s “Vorsprung durch Technik” has been demonstrated time and again, for example with quattro drive with self-locking center differential, the fully galvanized bodywork, S tronic and the sport differential. 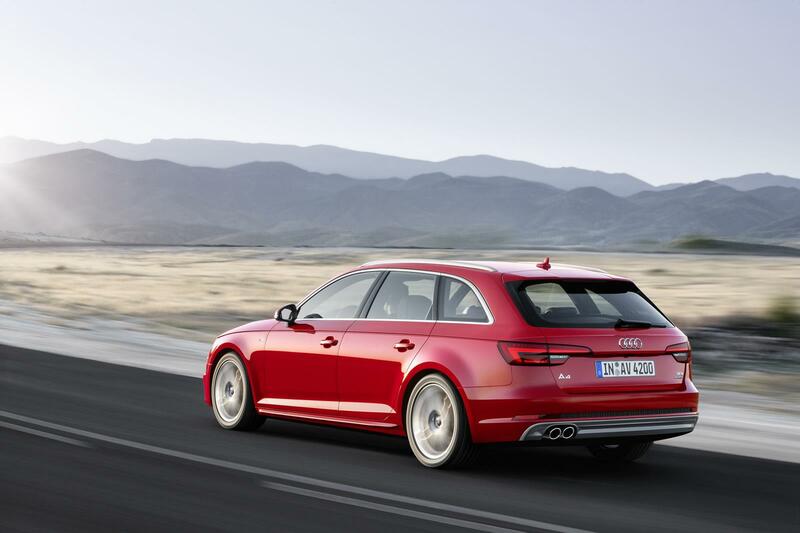 The A4 and its predecessor models have also enjoyed great success in motorsport. The series has produced legendary rally cars – the Audi Rallye quattro and the Audi Sport quattro – as well as superior track racing cars such as the Audi 90 IMSA-GTO, the A4 quattro Supertouring and the A4 DTM. This car is not yet on sale. It has not yet been homologated and is therefore not subject to the 1999/94/EG guideline.